Well most visitors to the island come for the legendary and infamous Full Moon Parties, most of the locals prefer the more low key, chilled out day after party called The Backyard. I was really excited to go to this, mainly so I could stand with a drink in my hand and watch the Full Moon revelers attempting to walk upright off the beach… Unfortunately my mystery illness meant I would spend the day in my hammock, which in itself is never a bad thing, but the party had sounded fun. At least it comes around every month. My couchsurfer, Stephanie (France), went with my neighbor, Cesar (Brazil), to meet up with my instructor Ricardo (Chile), it’s a regular old United Nations Party just with better music and more booze. After a few hours napping and killing mozzies (mosquitoes) in the hammock I decided to attempt to save money and do my laundry by hand. I grabbed my bucket that is kept filled with water to flush the loo, and my little packet of Tide Wash Powder. I scrubbed and soaked and squeezed and sweated and finally got it all hung out. I stood back to appreciate my work and immediately decided paying the whopping $1.50 to $3 to have it done was well worth it. Not only did it come back extra clean on the same day, it was also folded and dry… this batch of laundry would end up taking 3 days to get almost dry, got to love living in a humid climate. 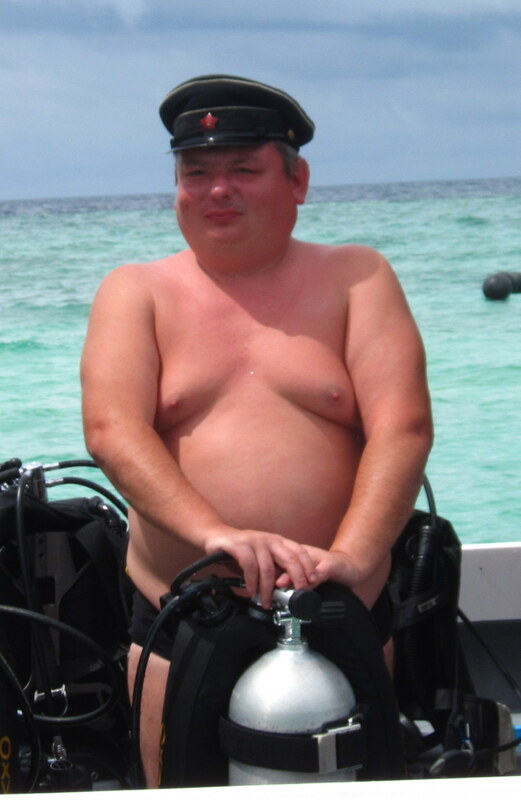 For those of you who remember my adventures on Seaventures Dive Rig in Borneo you would remember the crazy Swiss member of our Fearsome Foursome group that all dove together. 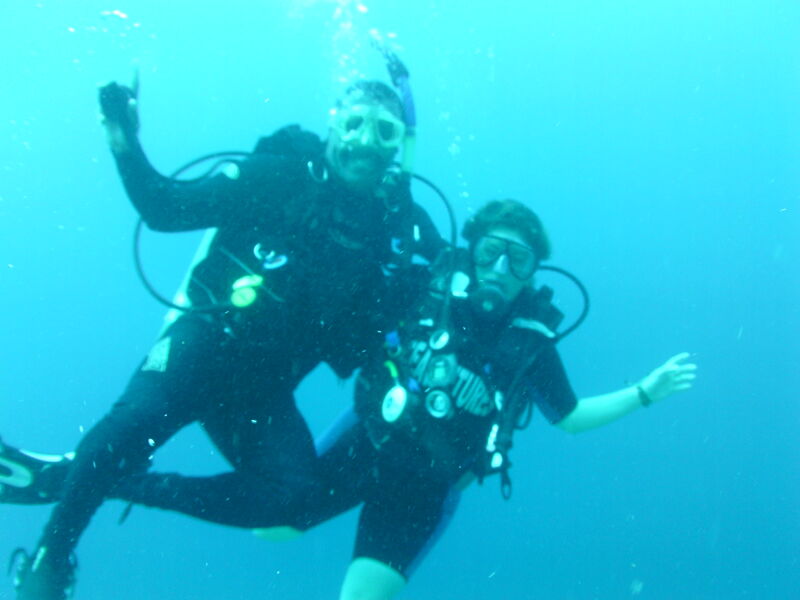 Urs, hearing I was training to be a divemaster on Koh Phangan, decided to make that spot his stop during a SE Asia trip. So after exhausting myself with laundry, I decided to go find him, he had messaged me saying he was staying at Malibu Resort which was right round the corner, literally. After wandering around the property for a bit I found him at the restaurant overlooking a rather stunning and well raked beach. We caught up on each other’s adventures over the last year and had a drink. Since he had already eaten dinner I decided to pop over to a local place for their Pineapple Burger and fries, highly recommended by Ricardo. We planned to meet at the shop where I would get Urs all set to dive in the morning. Before I left he handed me over a bag… while still in Bangkok he had asked if he could bring me something and, due to the lack of any kind of semi decent chocolate, asked for a large bar. Inside the bag was heaven in it’s purest form!!!! Heaven Does Exist in Paradise…and it’s in my freezer! At 2 Brother’s Restaurant I was the only customer as it was still quite early. I ordered my burger and fries and enjoyed my snickers and coconut milkshake while watching an insane looking cloud head my way. As I watched this ominous gigantic apparition of a cloud roll over the mountain towards Chaloklum town, I opted to take my food to go and enjoy it in my hammock at home. Making it just in time, so I thought, I reclined in my hammock and began to dig in. Unfortunately I discovered as hungry as I was I just couldn’t eat this delicious looking meal in front of me. So with a cup of tea I sat and waited to watch my favorite nature show, the arrival of a storm… unfortunately it seems as if someone gave the wrong preview as it barely dribbled, but it was still intense watching the mammoth cloud move overhead. I loved NZ and the Kiwis and got to amazing things there. Like dig my own hot tub at Hot Water Beach. Cover myself in thermal mud and take relax in a sulfur spring in Rotorua. 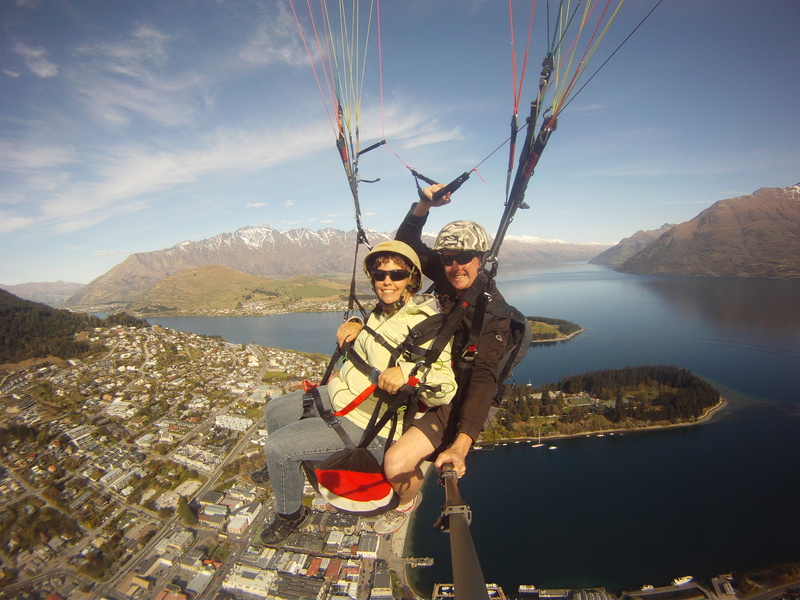 Jump off a mountainside and paraglide, screaming all the way, in Queenstown. I even ade it to all THREE islands: North (right upto the tippy top), South and Stewart Island (the 3rd) where I did trade work at Bunkers Backpackers, one of the best spots in all of NZ. The Best Part of NZ: friends, paragliding, mud and Stewart Island. The plan post NZ was to go volunteer in Sri Lanka at an animal shelter. They had contacted me and asked me to come promising accomodation and no fee. Sounded perfect and I was all set with tickets. Mid Tonga I got a message saying a returning volunteer was staying for 6mths and they were giving her my accomodation, but I could still come I just had to pay to stay… Well that blew that plan out of the water. My ticket on air asia was a ticket to Kuala Lumpur and then to Sri Lanka. I had great friends who I hadn’t seen in years in KL. 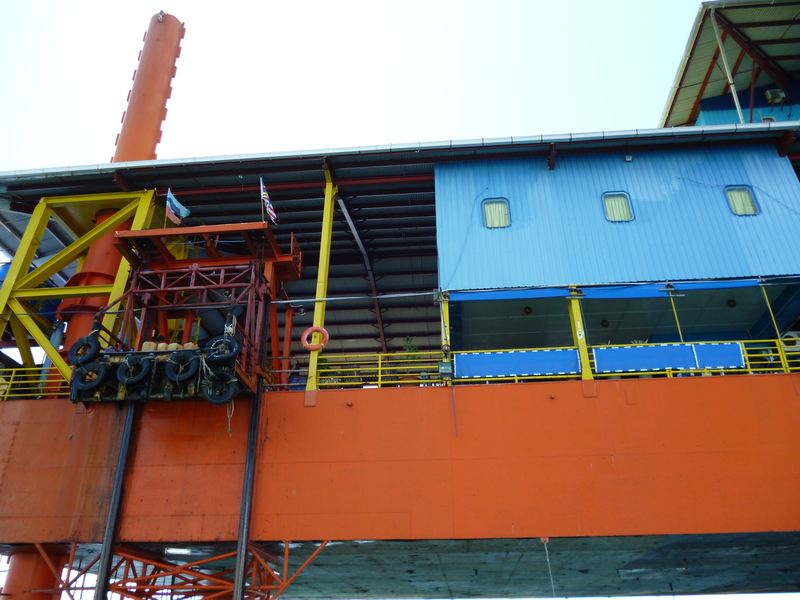 So I scratched my 2nd ticket and ate the losses, planned a short visit to KL then discovered a converted oil rig in Borneo (a short flight) for scuba diving. Sounds like a perfect recovery plan to me. I can’t tell you enough about how great it was to see my friend Chauw (first time in 7yrs) and meet his fabulous wife, Viven, and dog Pakkun (who really runs the house). They welcomed me like a long lost relative and put me up, fed me, and showed me around. It felt like home and I can’t thank them enough. I only wish I had had more time to stay. 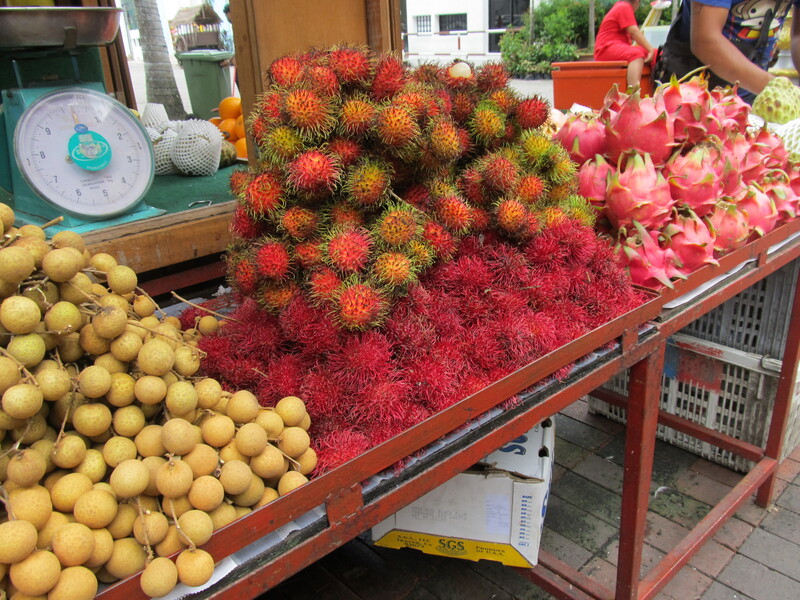 But Borneo beckoned and since I had to go through immigration it counts as a country on my list. 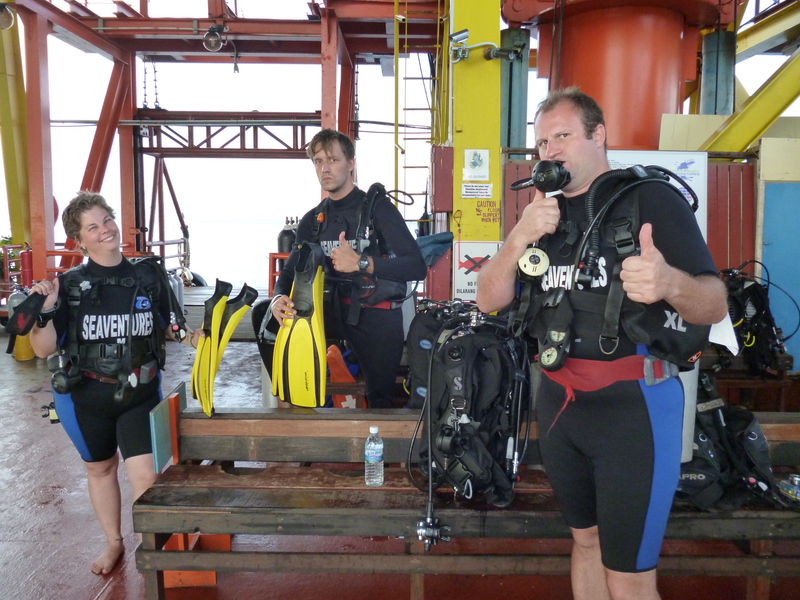 The Seaventures Dive Rig, a converted oil rig, was incredible and with a sealavator that went straight into the ocean a diver couldn’t ask for more. 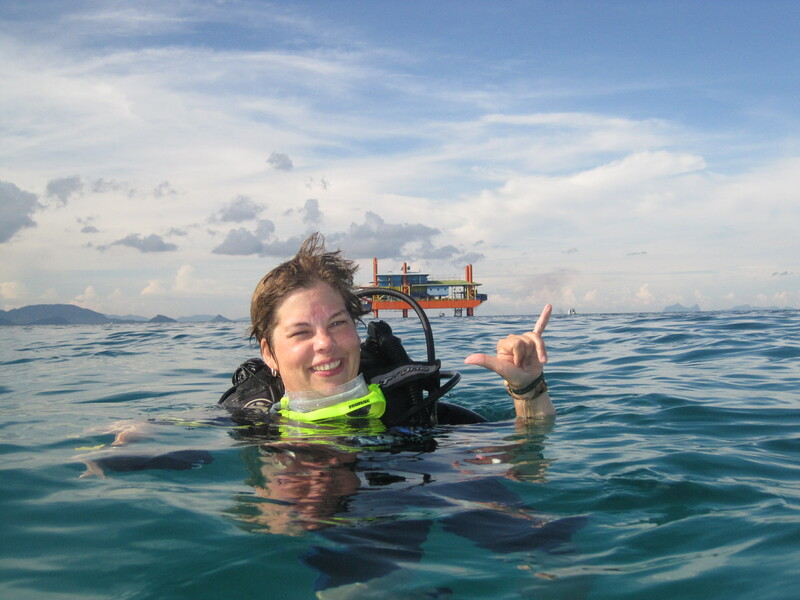 This was my first DIVE VACATION and my first in tropical water, the rig made it truly spectacular in every way. 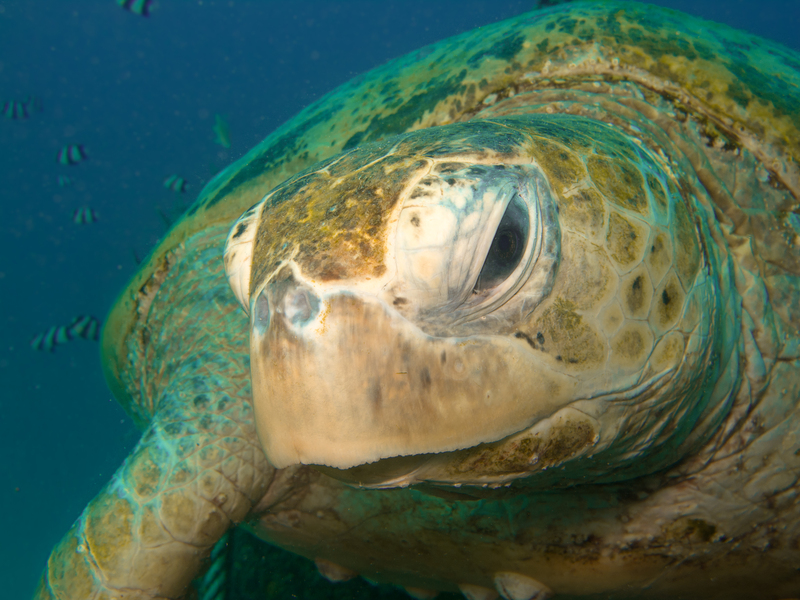 A Reason To Return: Friends, diving and so much more. Nepal is a country I have always dreamed of going to and never thought I would. 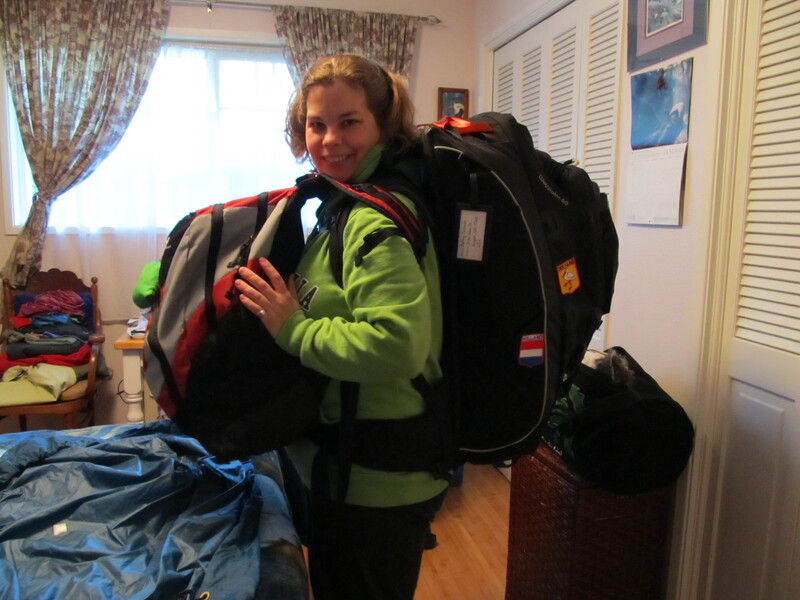 Most people go to trek, to get to base camp at the very least. 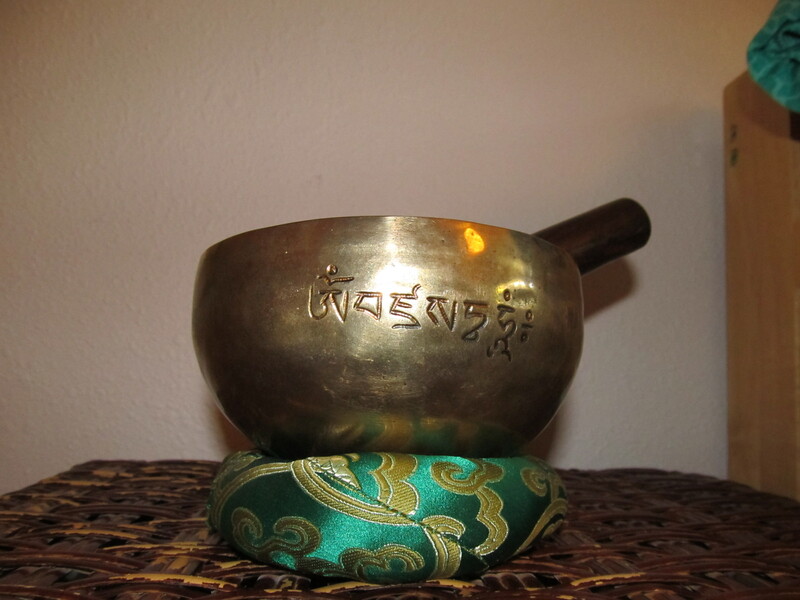 For me, I wanted to buy myself a singing bowl. Since the first time I saw one of this beautiful bowls that “sing” as you pass a wooden stick around the outside, I have promised myself to only get one when I got to Nepal. It took me almost the full 3weeks to find the right one, but she sings just perrtty for me and I love it. Nepal was fascinating and, unknown to me, would introduce me to someone who would change my life for good in many ways, but bring it crashing down with a terrible betrayal. But you can’t blame a country for the actions of one person and so I focus on the people like Laksmi and her family who essentially adopted me in Pokhara. I went to dinner at their house, helped my new little brother, Gaurab, with his homework, even moved hotels closer to them (with Laksmi’s husband’s help). I spent many good hours chatting with Laksmi and I will miss my “sister” very much. 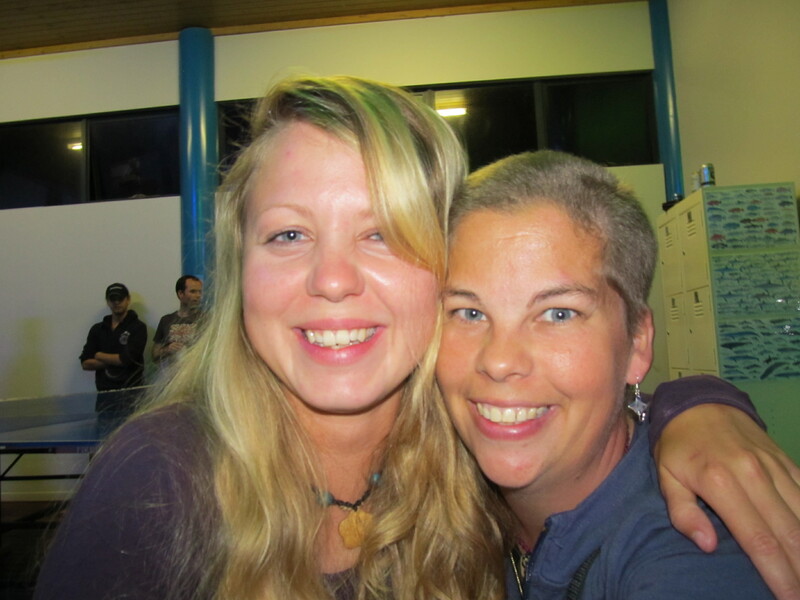 Cathleen, who I had met in my first country of Peru, and I had joked about me coming to Germany on my way home. Low and behold fate saw to it that I did. While I was super sad to leave Nepal, I was super excited to Cathleen again and well Germany in December means: Gluwein, Bratwurst, Christmas Markets and Christmas Cookies. Woohoo! Cathleen met me in Hamburg with her amazing friend Hendrik, who put us up for a few days. Then came the whirlwind tour of Hamburg and Berlin with a final stop in Leipzig where Cathleen lived. Fate also allowed me to catch up with Carolin and Nadine, friends from Australia. The Worst Thing in Germany: My heartsickness at missing a guy and ending a trip (not really Germany’s fault). 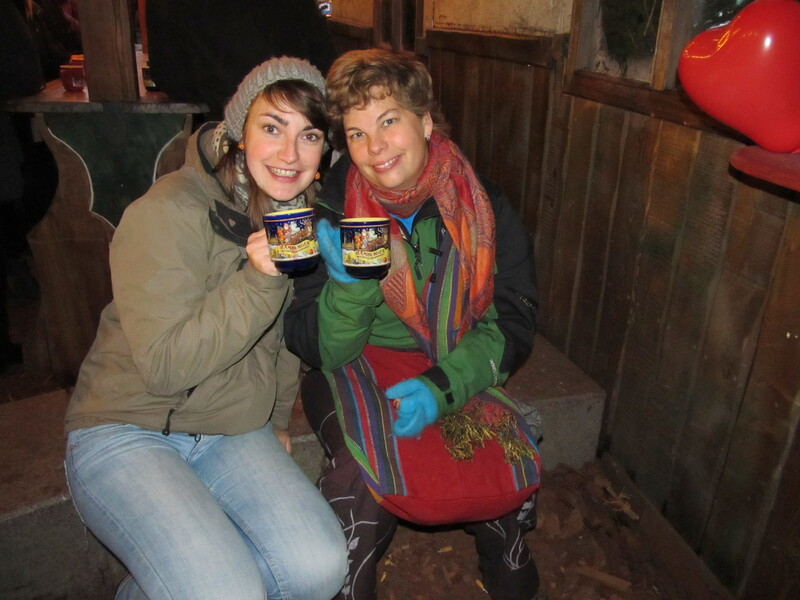 The Best Thing in Germany: Gluwein, bratwurst and Christmas markets… and fabulous friends. A Reason to Go Back: need I repeat the above?? Oh and add the bakeries and the cold meats, mmmmmmm….. So after 347 days on the road, just shy of a full year, I finally made it home! For those of us who love long term travel, going home is both a blessing and a curse. We get our own bed, we see family, have home cooking, and 3 days later we want to pack our bags and head out again. As someone once explained to me, finally giving me an explanation I could use for non travelers, “traveling is a double edged sword…you live you grow you explore but you never feel settled”. 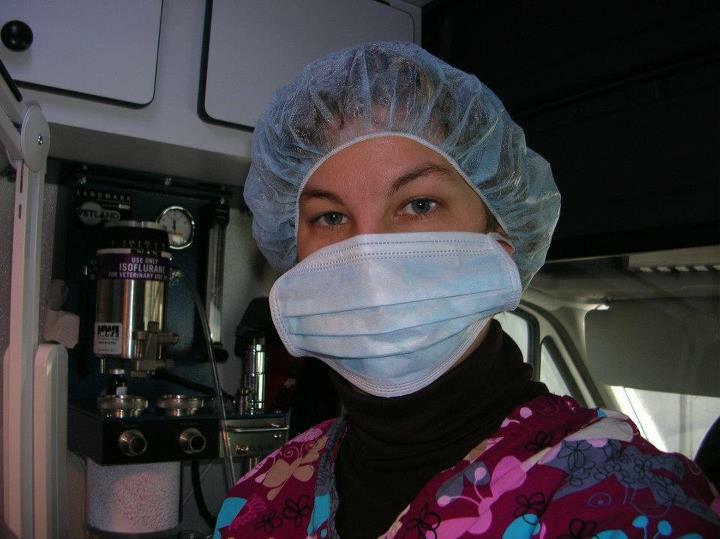 Starting my job as a vet nurse with a mobile vet barely 3 days after getting home at least helped that trapped feeling from catching a full hold. And being mobile kind of felt like I was still moving. Something I learnt on This Trip: I am stronger than I look, and I love being near a warm ocean. My Worst Experience: Can’t say that anything was terrible, but let’s just say I learn a lot of lessons about life. One thing is for sure, I prefer living abroad and plan to find work that gives me that. As much as I loved all the travel, there are times you want to stay put for longer than a month or 2. 2011 was an epic year in so many ways, good and bad. I still can’t believe that I visited 8 countries (9 if I can count Malaysian Borneo separately, I did have to go through immigration) in under 12months. When plans to volunteer in Botswana fell through I felt I needed somewhere else to replace those months before heading to Australia and New Zealand. It’s not like any tickets were bought or anything, it was just something my mind had decided on, there had to be a country or two before. I was at a loss of where until a friend said “don’t you know someone in Peru?”. 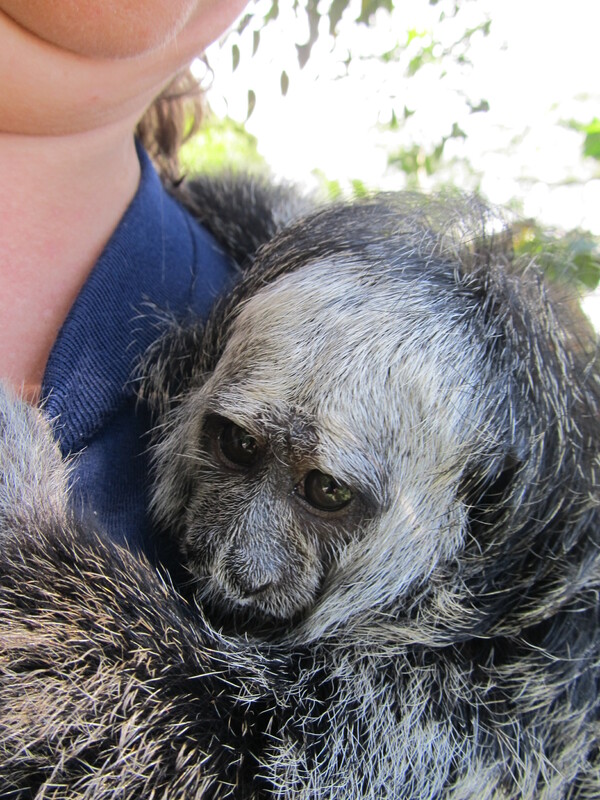 Why yes I did, a co worker from the Seattle Woodland Park Zoo. Fernando was our imported penguin expert for the new exhibit and all of us summer employees got on really well. So I contacted him and it was on, Peru was destination 1. I honestly had no idea what to expert, I had never been to South America and the only Spanish I knew was hola. But ever the one to shrug off obvious adversities I booked my ticket the day after my 33rd birthday. Now only 4months and 5 days till I would leave. 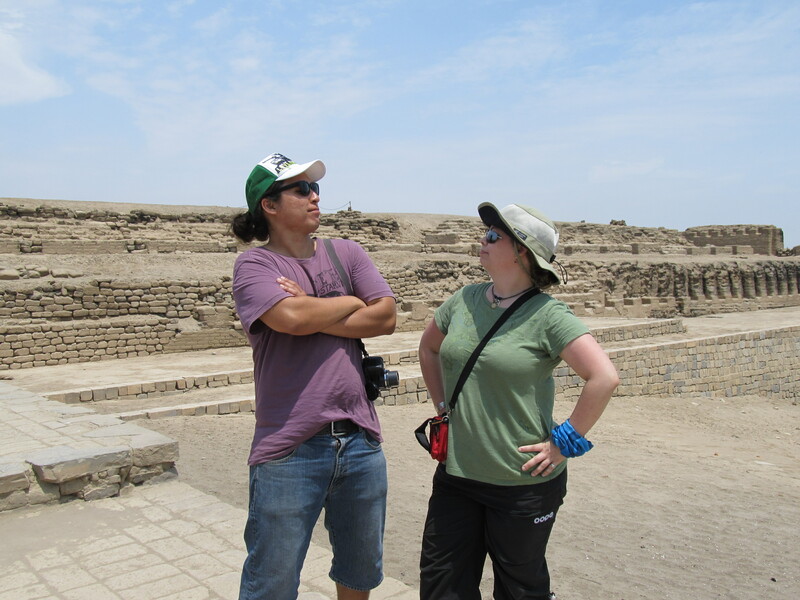 Peru was amazing, and I loved every minute of it. Cusco is now one of my favorite cities, although next time I am definitely pre-dosing on the altitude tabs… Man that hit me hard. Machu Picchu was at first unimpressive, just a ruined city in the rain… the the clouds parted and it all became clear why it was so revered as a must see, that and the thought of “what bloody crazy idiot would make his people lug thousands of stones up a mountain side that scares the living daylights out of on the bus ride…and down??”. Seriously, it was breathtaking. 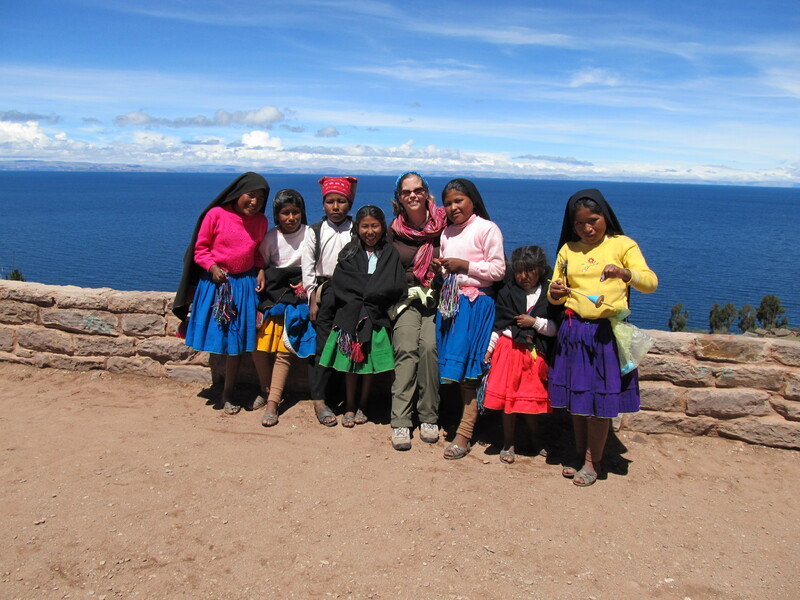 Lake Titicaca, just giggle everytime I say that, was awe inspiring and I would love to go back. However, the port city of Puno was a real dump and I was glad for fellow traveler advice to avoid it as much as possible. 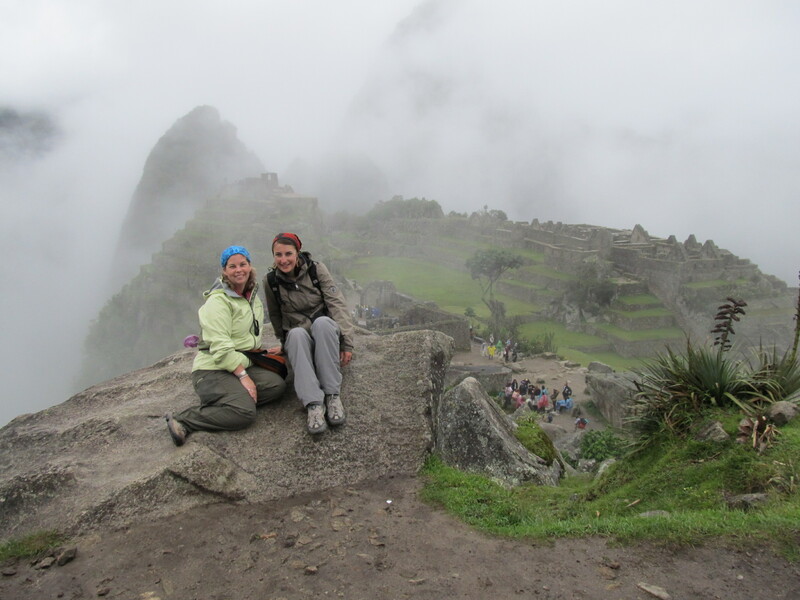 The worst thing to come from Peru : The altitude sickness that actually had me bed ridden for a day. The best thing to come from Peru : A great new friend named Cathleen! I was almost to the point of buying tickets when my mom held out a newspaper article about volunteer travel. 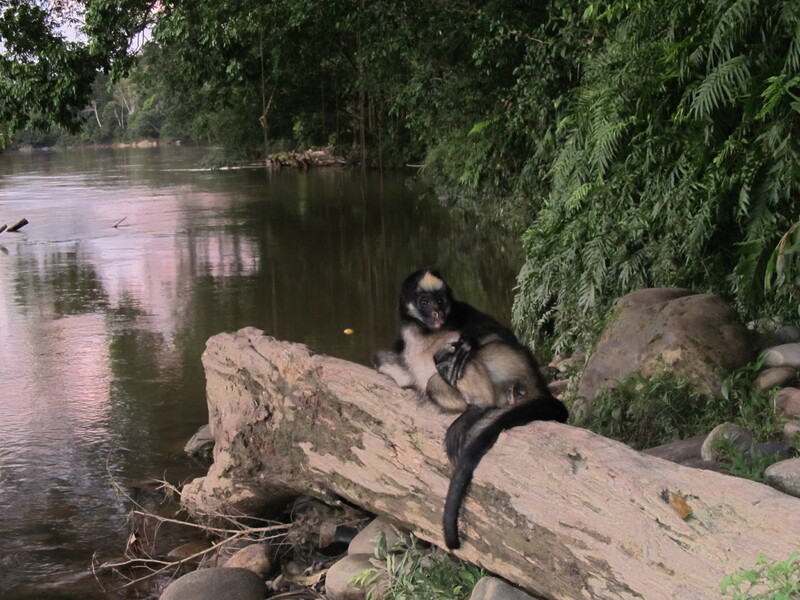 It had a 2 sentence blurp about Amazoonico Wildlife Refuge in Ecuador. The part that caught my eye was the minimal cost of $120/month for food and accomodation. Bonus! I dropped them a line and soon had that on the map. Or actually I couldn’t even find the town of Tena on the map, but Ecuador was right about Peru so how hard could it be. 42hours later my bus (with the locked bathroom) pulled into Quito. 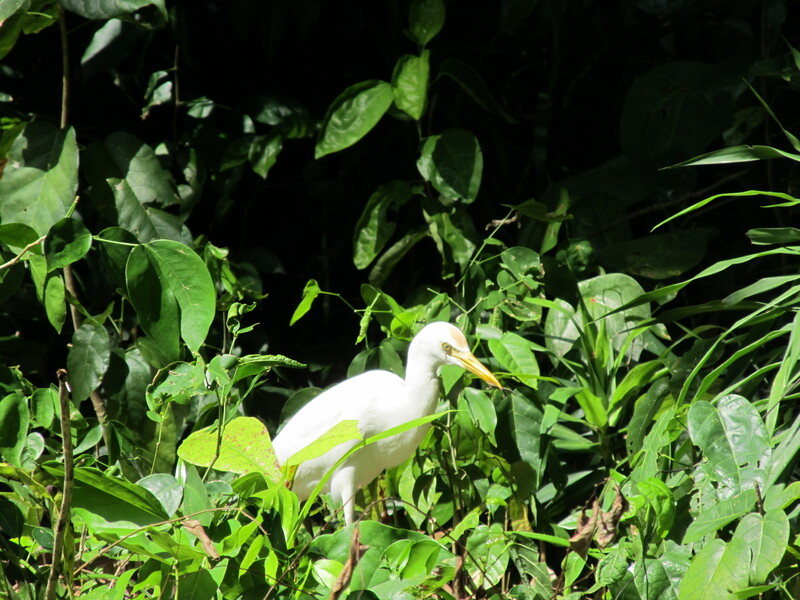 Have you ever experienced the need to pee so bad that you can’t… Let’s just say when I could finally see through the wall of water in my eyes, I was in love with the loos of Ecuador. At least the one in the daughter’s home of a lady I had met in Spanish class and who was kindly putting me up for a few days. 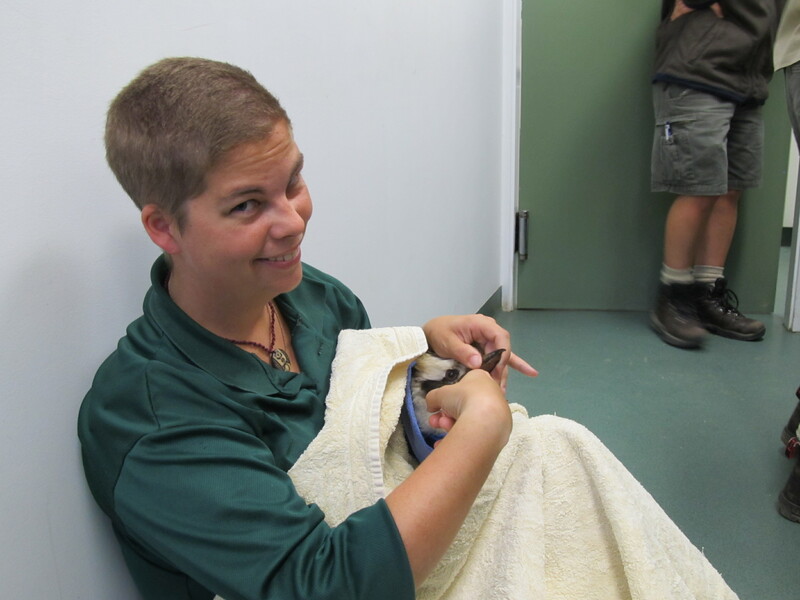 My two months at the refuge came with high highs and low lows. The first month was tough as I was the only new volunteer, all the others were girls averaging 21 and had Spanish as a common language. By now I think I could almost say my name and ask where the bathroom was. In short it soon became apparent I was back in highschool and … I still wasn’t popular. My amazing volunteer co ordinator, Sarah, took me aside and said “you can leave, or you can stay and it will change your life”. Who am I to argue with authority, I stayed and in that first month got through a good number of books and enjoyed my alone time since group time was in Spanish, which I was picking up quite well. The second month was much better, we had a new cycle of fresh blood, English became the common language, I was a senior volunteer (and ok I admit I love being the one who needs to teach others), and I discovered my gift for making cookies… That pretty much made me popular in high school! It was very hard to leave. At the end of my time in the jungle I went to the ocean and saw blue footed boobies… again another thing that just makes me want to giggle. The worst thing to come from Ecuador : Struggling with the volunteer dynamics that first month. The best thing to come from Ecuador : Blue Footed Boobies!! Oh and discovering an inner strength. A reason to return : Perhaps a chance to see the Galapogos. It turned out cheaper to fly back to the states and then to Australia rather than from Peru to Aus. So I found myself with 8days in the states. I decided to surprise my parents for Easter. Officially the best surprise I have ever pulled off. The first time they were ever speechless. Australia and New Zealand were always on my list, part of the reason for this trip was to find a place I might want to live and since they were on the “most likely” list. 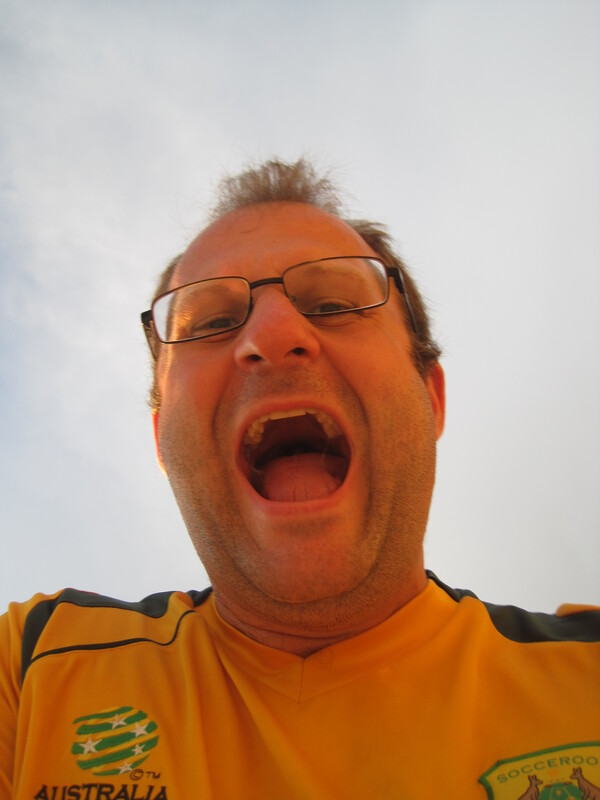 My first impression of Australia, especially after 3 months in South America, was “Oh shite!!! I can barely afford a coffee”. I was shocked at the prices and the Aussie dollar was stronger, of course that changed a few weeks after I left… I quickly worked out plans to mooch… I mean visit any friends and family I had, along with sorting work trade with hostels. I attempted work trade at a farm that has now become known as the Looney Farm by all of us who were there. I saw Koalas, Kangaroos, Platypus and many other strange and wonderful critters. I saw friends I hadn’t seen in over 10yrs. I shaved my head for charity. I swam with manta rays. I swam in a freezing lake. It might have been expensive, but I have some amazing memories that are worth every penny. The worst thing to come from Australia: The cost. The best thing to come from Australia: Shaving my head for charity. A reason to come back: Friends and a little town called Coral Bay. 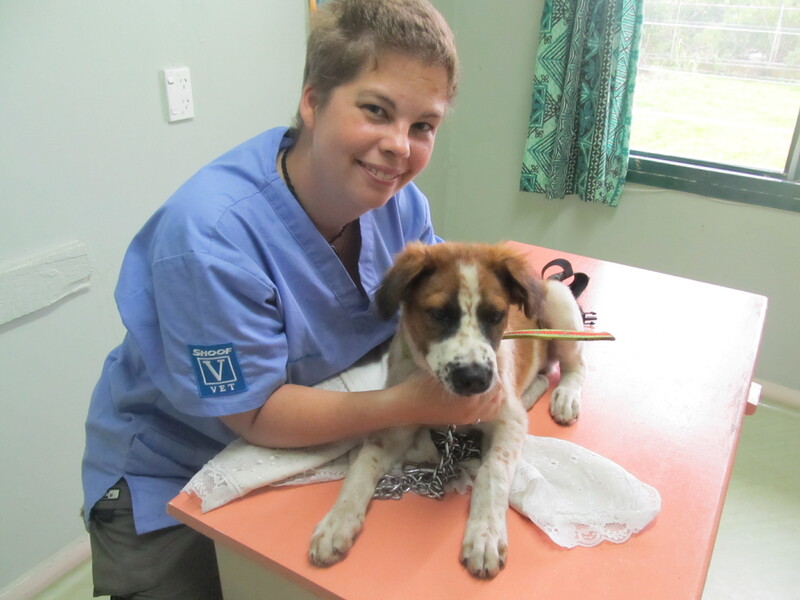 I discovered this amazing organisation that spent a month on the island of Tonga every 3months running a vet clinic. I contacted them months before arriving and was super excited. Accommodation was included and there was no fee to volunteer. 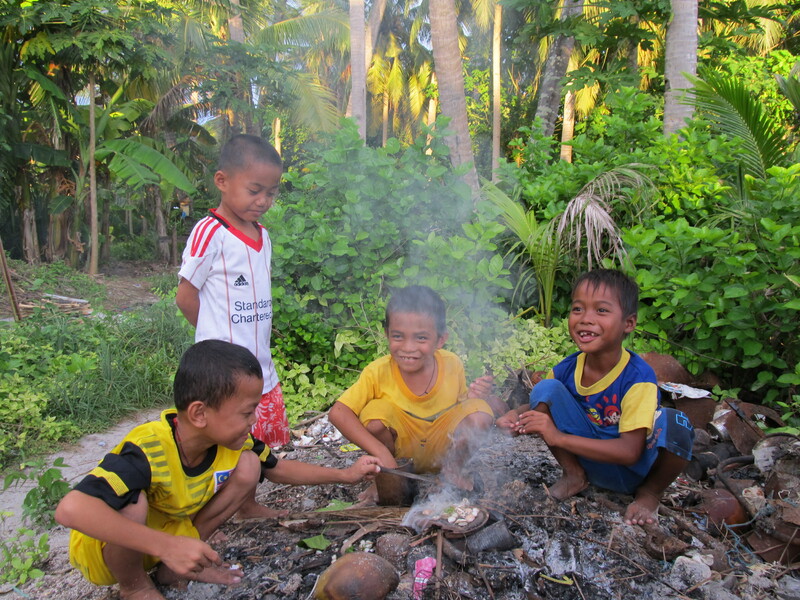 A great way to experience island life and do something good for the community. This was a month of extremes, as it turned out there had been a misunderstanding and I went from being a vet nurse to designated pee/poop cleaner and coffee maker. But I had committed to a month and so I pushed through proving my skills on more than one occasion when they needed me to monitor during surgeries when no one else was available. I think one of the biggest problems was that I was there in the middle of a year long trip and to volunteer while reserving my finances, the others were there as a vacation and had money to spend. At the same time I met some amazing people, locals and expats (including 4 South Africans, what are the odds) and got the chance to visit one of the outlying islands. No Matter What, It Sure Was Pretty! 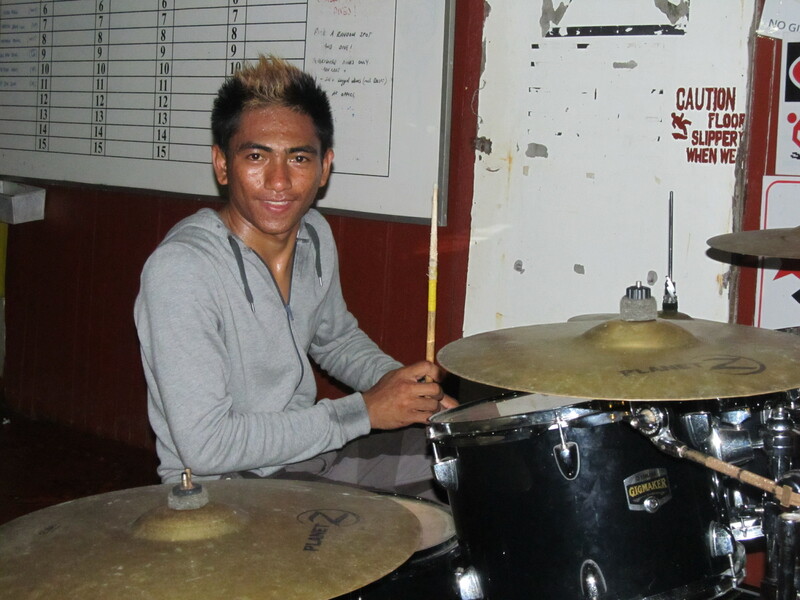 The worst thing to come from Tonga: My treatment by the other volunteers and the organisation. 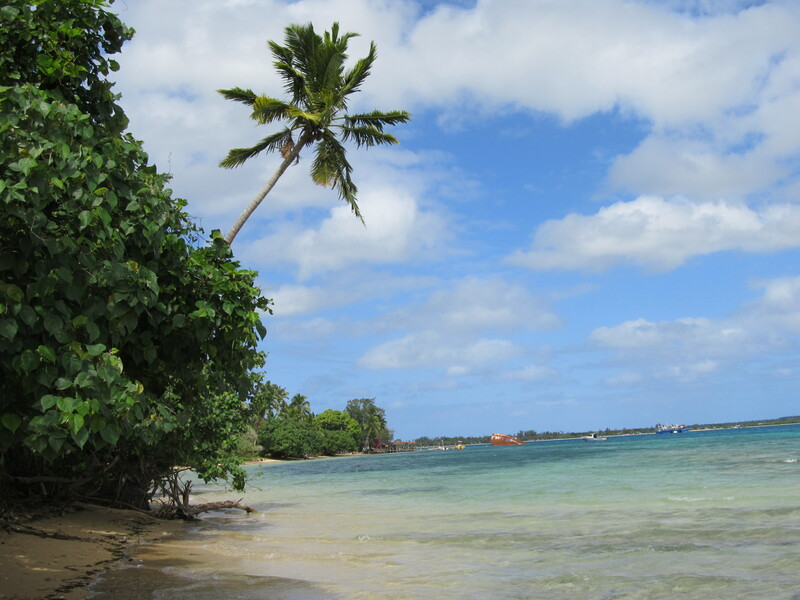 The best thing to come from Tonga: Fulfilling my commitment and discovering an amazing culture. A reason to go back: maybe for a vacation and not to volunteer. I must admit I had a hard time finishing this post for some reason. So many things that go through my mind and writing this entry makes the journey complete. Luckily there are still many more to come. All good things come to an end… As much as you wish the good times to last for an eternity, all too soon it is time to say goodbye. On our 3rd day we said farewell to the insanity that was Urs, it wasn’t the same without him! That night the staff put on a fabulous concert with great music. Unfortunately all of us were so exhausted from a full day diving that we crashed early, we also all had another 5.30am morning. Our final day in Sipidan did not disappoint as usual. 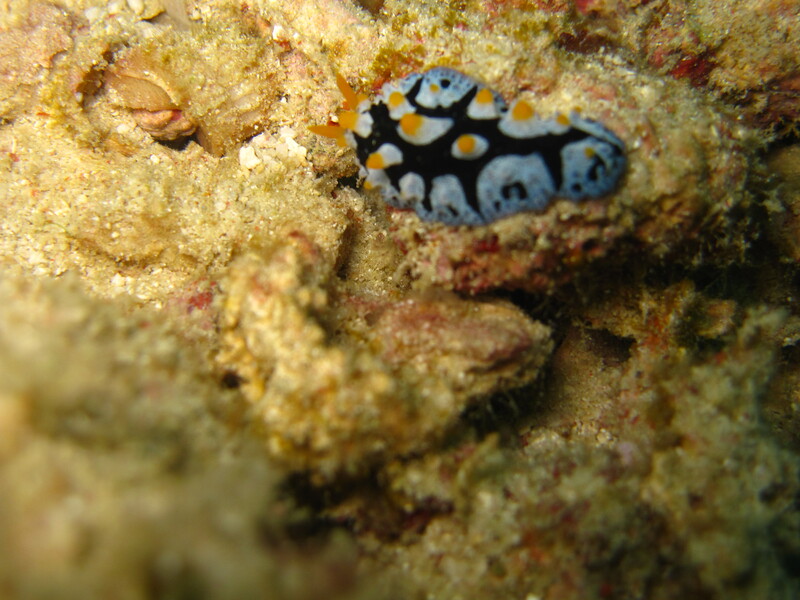 Although on my 2nd dive, distracted by a stunning nudibranch, I went a wee bit too deep and my dive computer freaked out and started beeping. Me, having never dove with this type of computer, pretty much ignored it, except for the part about doing a 5 minute safety stop before surfacing instead of a 3 minute. 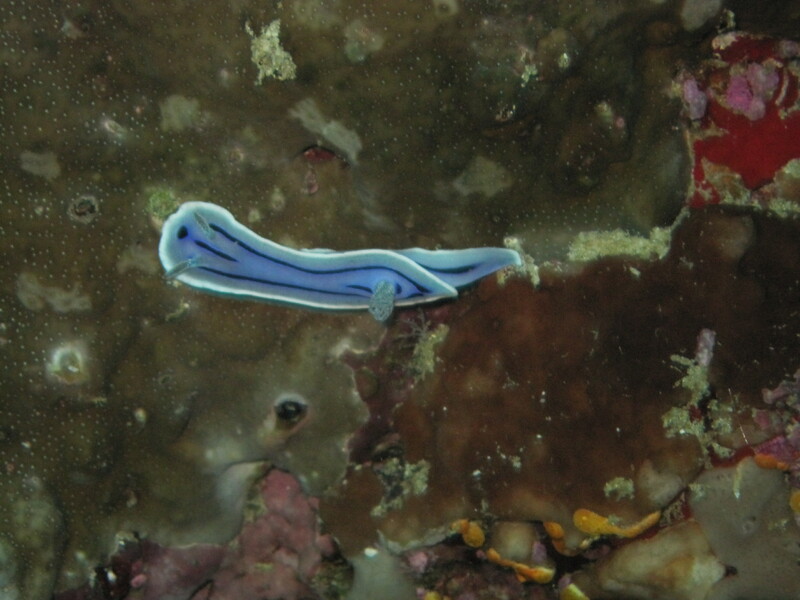 I knew I had done something wrong but wasn’t sure, the nudibranch was awfully pretty. At the lunch break I asked one of the instructors and he told me it should be fine just stay about 15m just in case. During the start of our first dive there were 3 large underwater explosions. The 2nd one being so loud and sounding so close that we felt our teeth rattle. In truth these were many many kilometers away. The locals, especially in the Philippines, use dynamite or homemade explosives to fish. The explosions stun the fish which then float to the surface. 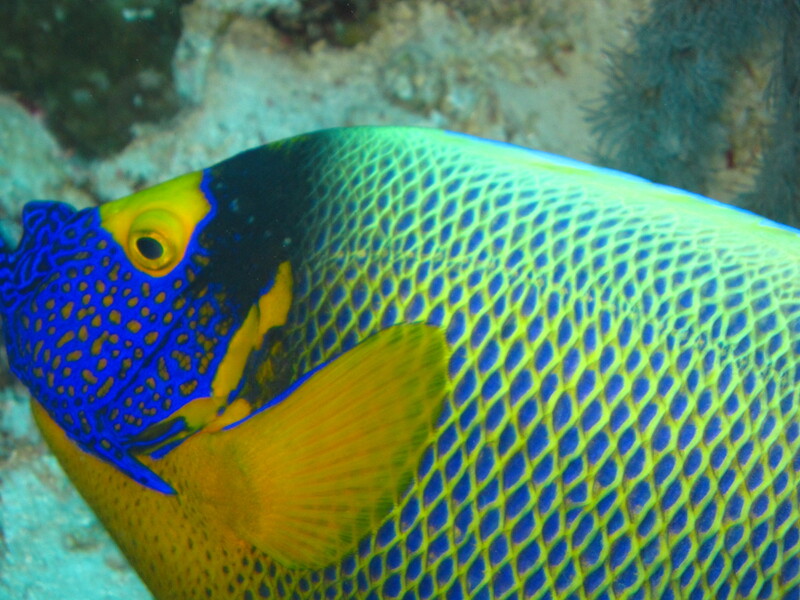 Much easier than spending hours with a rod or net, but also extremely destructive to the coral and surrounding animal life, not to mention divers. 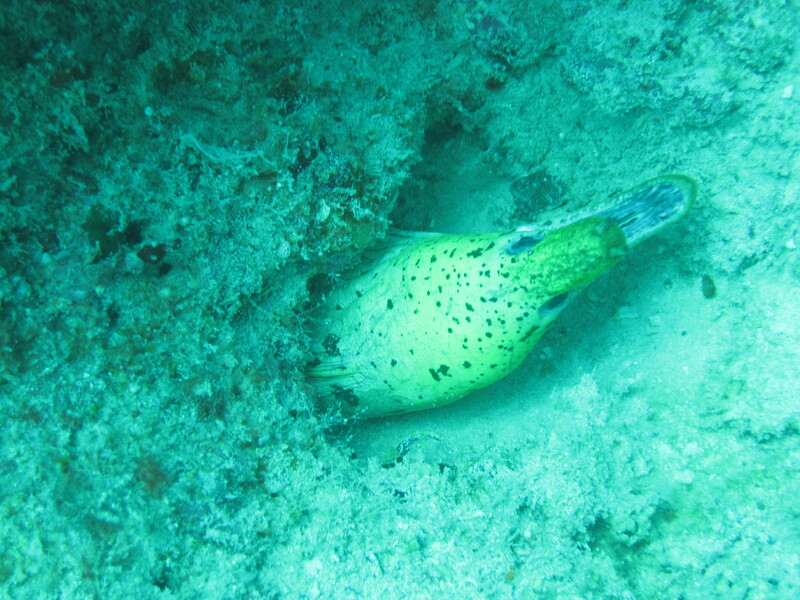 On all 3 dives I spotted 2-3 nudibranchs, 1 lobster and was 3 for 3 on some of the biggest moray eels I have ever seen. In one dive we came over a ridge in the coral and discovered a vast valley below us. Due to the strong current we just floated along above it, I could only assume this is what underwater paragliding would feel like. Truly spectacular sensation. Why is it that as soon as you get yourself adjusted to buoyancy (that took me 3 times to spell) and being able to spot the micro life around you, it is time to go. After a final lunch, sad farewells it was time to take the sea-lavator for the last time… Martin and I were leaving and Dave remained the final of the Fearsome Foursome on the rig. Thank you to all the fantastic staff who made this trip fantastic! Special thanks to Instructor Ricardo and John, to Instructor Midgi for loaning me his mask, to dive buddies Martin, Dave and Urs, to dive friends Matt and Laura and everyone else. 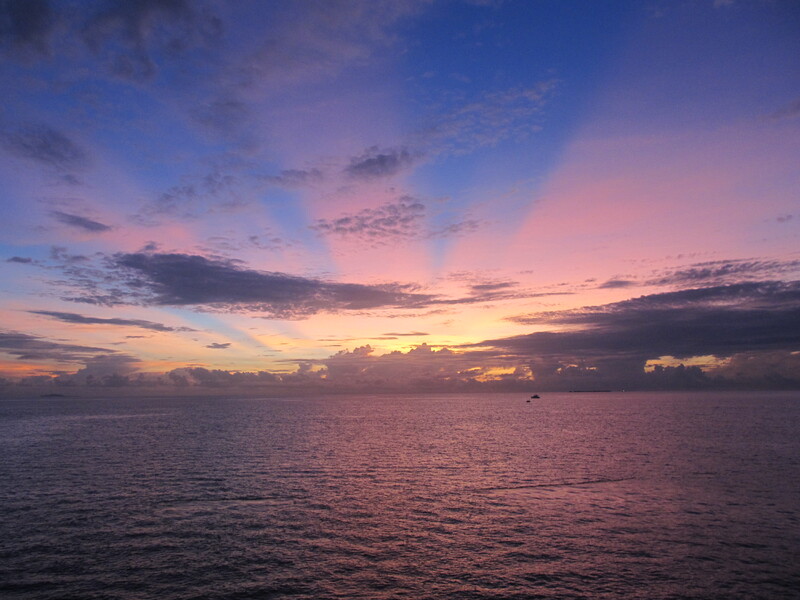 It was a sad, yet stunning boat ride back to Semporna and the mainland of Borneo. When we arrived at our dock we discovered the shuttle driver hadn’t unlocked the gate and appeared to be sleeping in the shuttle. But after a good 10minutes he finally heard us and let us out. The shuttle turned out to be air conditioned so none of us could truly blame him. In town Martin and I parted ways planning to meet in an hour after settling in. I had planned to stay at the Scuba Junkie backpacker hostel, located closer to the center of town than the last one and with what appeared to be a great vibe. But when I got there, there was a mix up. Before I left for the rig, I had made a tentative booking on a dive and hostel stay but when I decided on the extra night on the rig I called and cancelled. It appeared as if the person I spoke with had not passed on the message. But after some confusion there was no problem and I paid my 10ringit (about $3.30). As I was about to go to the dorm the receptionist said “first check in for your dive”. When I explained I had cancelled it he said that non divers had to pay 15ringit. I was a little annoyed with this as no one had told me, and Martin was paying 27ringit for his own room and bathroom. So I said screw it, cancelled the booking and went to the hotel. 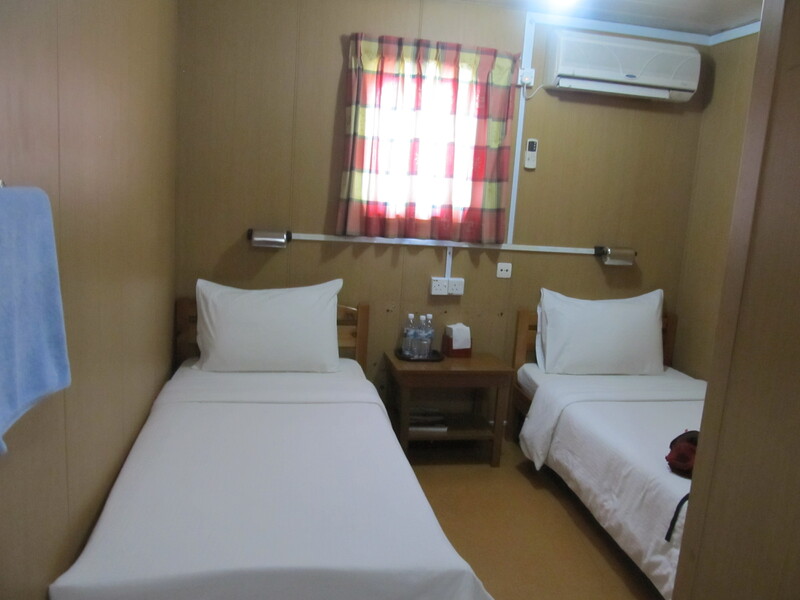 A room of my own with bathroom, air conditioning and…wait for it… the movie channel, sounded way better than a crowded 10 bed dorm room. Martin and I met to run some errands and hunt down postcards and stamps. Both of which were reasonably unsuccessful. Then it was nap time before meeting for dinner. 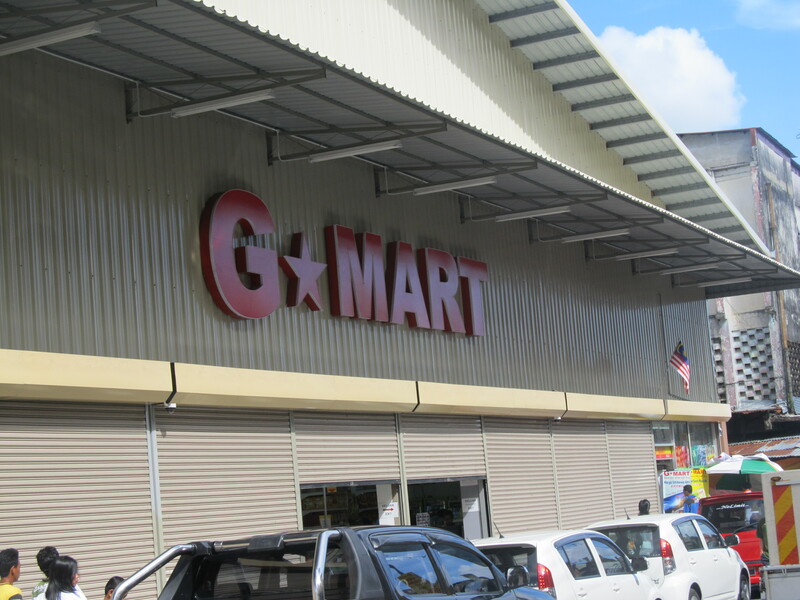 Martin took me to a local place where we ordered some yummy fish and rice and chicken dish like thing and I got to practice my Malay, to the bemusement of the staff. (please note I fear the words I tried to learn stayed in my head for about as long as calculus did after graduation – wish my brain could retain more). Martin was leaving in the morning to get his visa to enter Philippine Borneo (think that is how you say it), so we said farewell and hopefully we will meet Urs and Dave in 2 yrs for our reunion dive. I spent all of the following morning wallowing in my air conditioned, comfy bed watching movies. Its a hard life but someone has to do it! Then at checkout I still had 4 hrs before I would leave to the airport, so exploring the town, lunch and chilling in reception was the plan for the day. Luckily I had found a group of 4 also on the same flight and could take a taxi with them, 20ringit each, a saving of 70ringit if I had gone alone and much hassle if I had taken the bus. With only about 1hr before the flight I decided to forego dinner and go straight through to the gate. We had to go through immigration again, even though I was still in Malaysia. Barely 30min later and I glanced at the departure screen and the lack of my flight on it. Finally in the confusion I looked lost and forlorn at the gate where the flight had previously directed me to go. One of the attendants from a different airline asked if he could help and ended up escorting me out through immigration and right to the Air Asia information counter. As I feared Air Asia lived up to its reputation and the flight had been delayed another hour. Well then I may as well have some dinner. With 20min to go many of us headed down to the gate and were promptly told to go right back up the stairs as the check in point was up there. Finally after a long day we finally left and arrived in KL late in the evening to find Chauw there to pick me up. Such good friends are hard to find. Heading out for dinner and then home it was great to be back and see Viven and Pakkun again, but it was straight to bed for me. 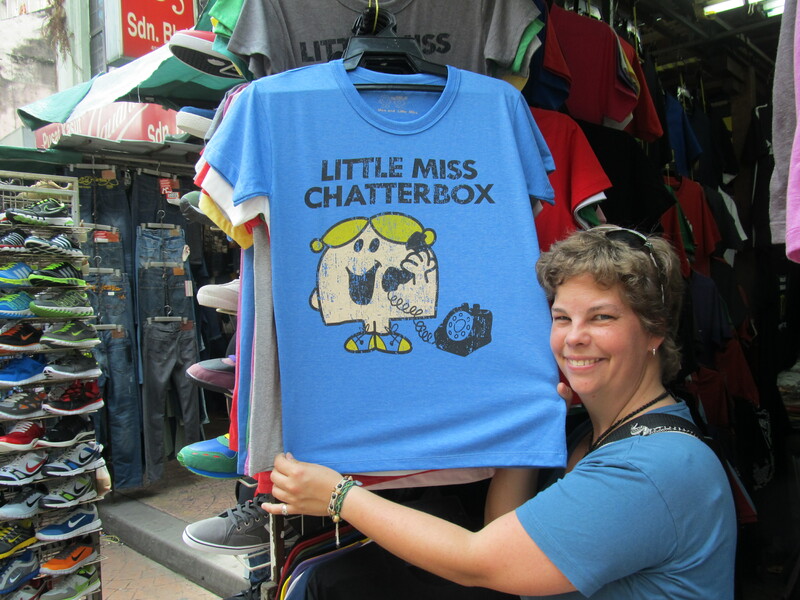 We spent the final day exploring the KL China Town and market. It was great fun and there were awesome things to choose from. 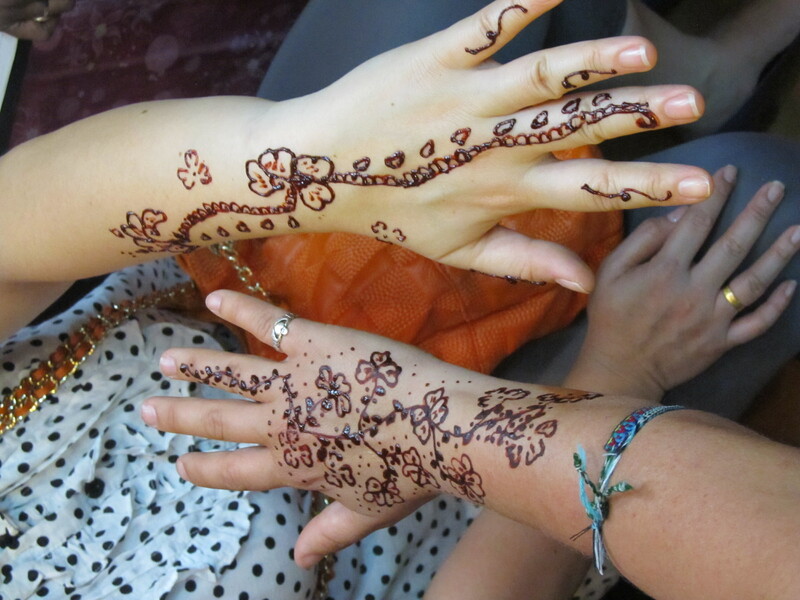 At one section of the “Asian Market” in the India section Viven bought me a pashmina (which has come in very useful during Germany) and we decided to get Henna/Mehindi tattoos. Our last adventure had me search out a portable hard drive. I had seen many travelers with these nifty little things but they always seemed so expensive, but rather handy. 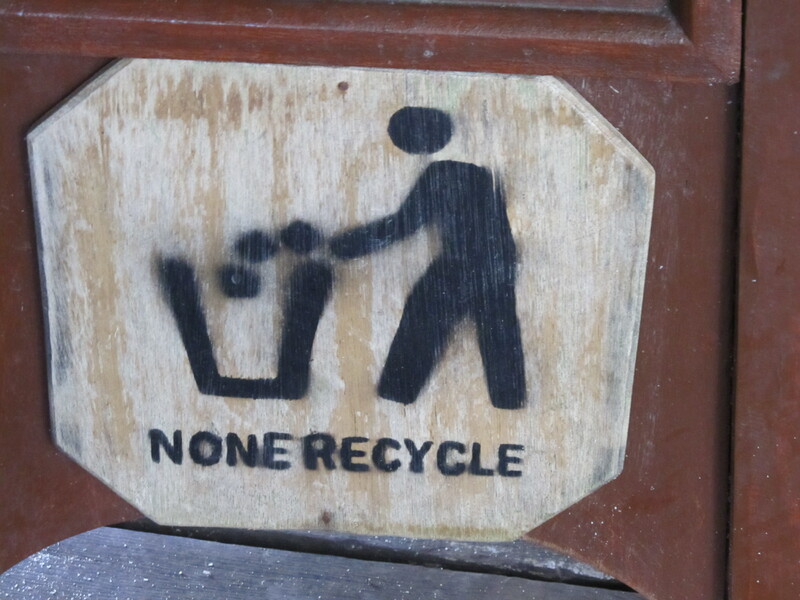 I had never seen the need, until I started reaching critical on the number of photos I had on my poor little netbook. eventually we found one at a rather decent price and so headed home with my new toy to pack and nap. The next two days I succeeded in getting Sipidan permits as well. This was great as in it is a stunning dive site. But bad as it meant 5.30am wake ups every morning and I would have loved to have at least 1 day exploring Mabul or one of the other islands. Then again as soon as you were in the water, it was all worth it. 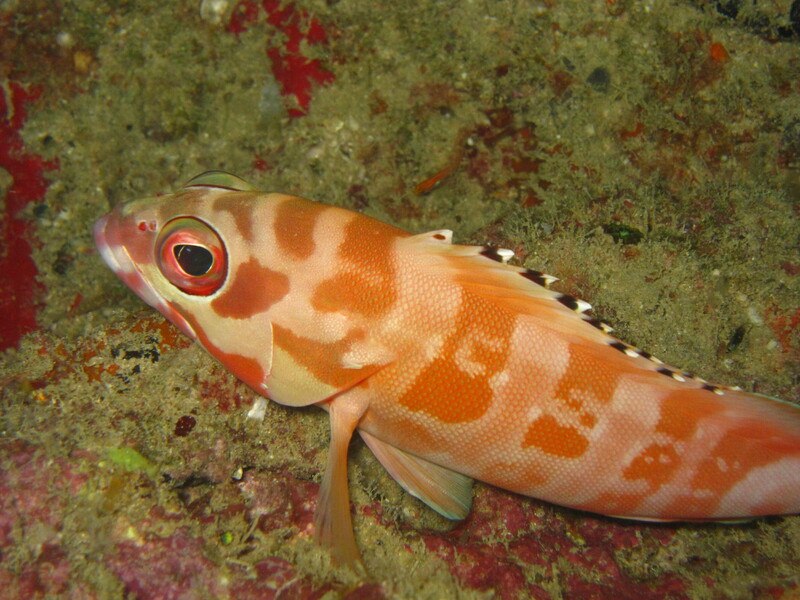 Every dive I would concentrate really hard on remembering characteristics of each fish, but no matter how hard I tried I was always stumped when it came to ID. 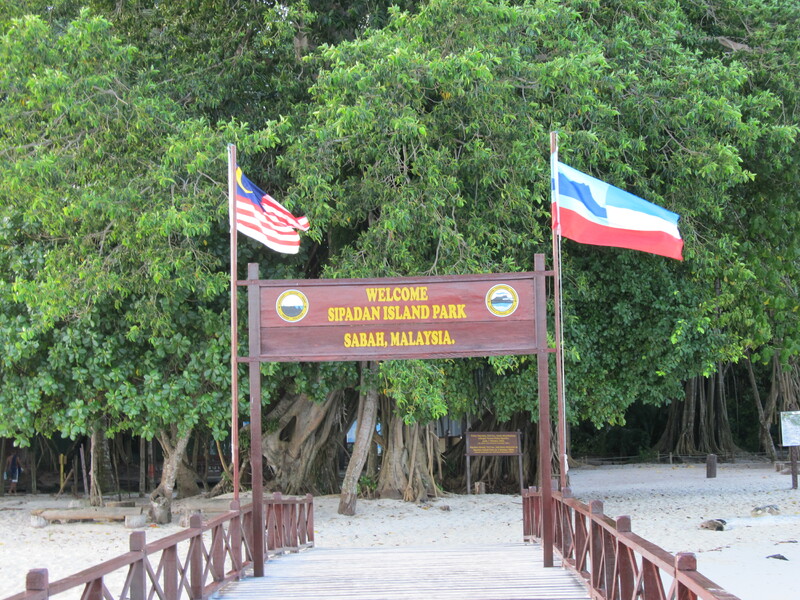 Sipidan Island is the only oceanic island in Malaysia. Meaning it does not sit on the continental shelf but is volcanic in nature, formed by coral growing atop an extinct volcano. 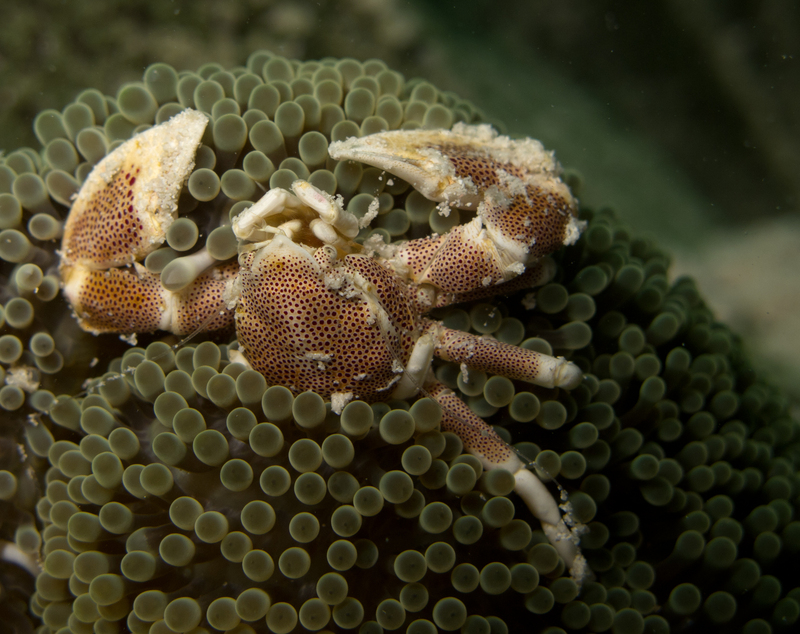 Found off the east coast of Sabah on the island of Borneo, it is located in the heart of the Indo-Pacific basin, the centre of one of the richest marine ecosystems in the world. 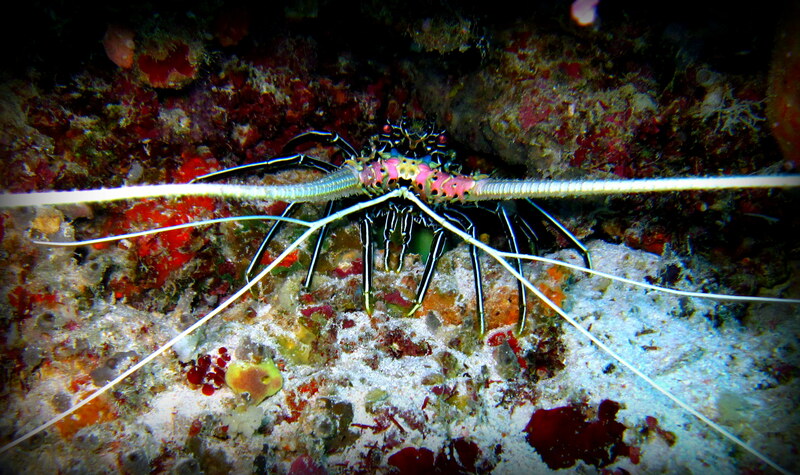 It is no surprise then to find at least 3 of it’s sites on the top 100 dive spots of the world. 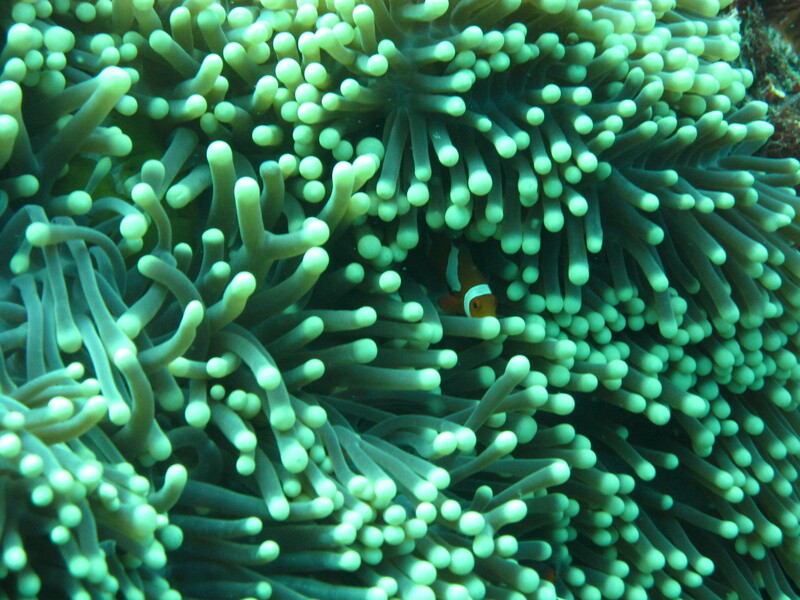 An important note is that the Seaventures Rig house reef is number 74. So rising at sparrows fart, 5.30am, I headed down to the main deck to have some coffee (or rather milo/coffee mix introduced to me by Martin) and watch the sunrise until we headed out at 6am. The weather was already warm and balmy but the sunrise was spectacular. Once we had all gathered and got our gear sorted we headed down the sea-lavator. It was a glorious morning as we sped across the waves for a 30min ride to Sipidan. 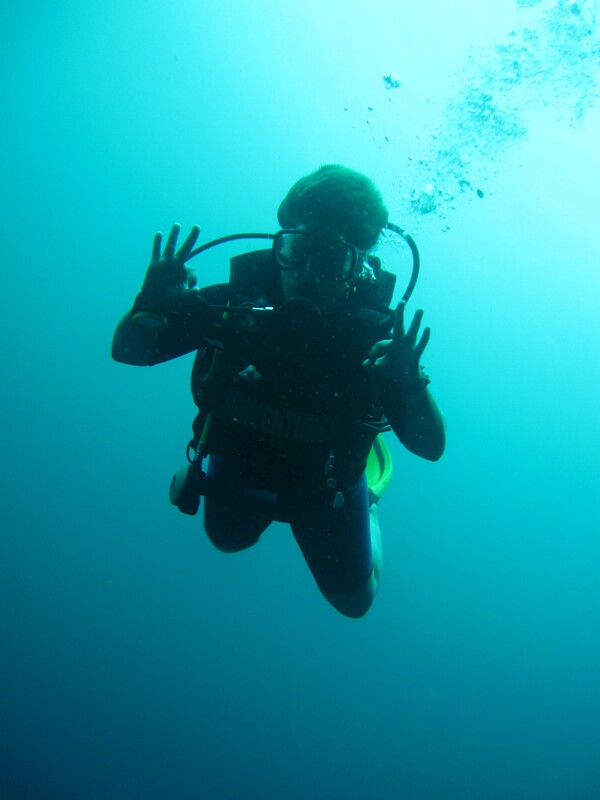 Todays lead instructor, the mysterious instructor from yesterdays dive in Mabul. 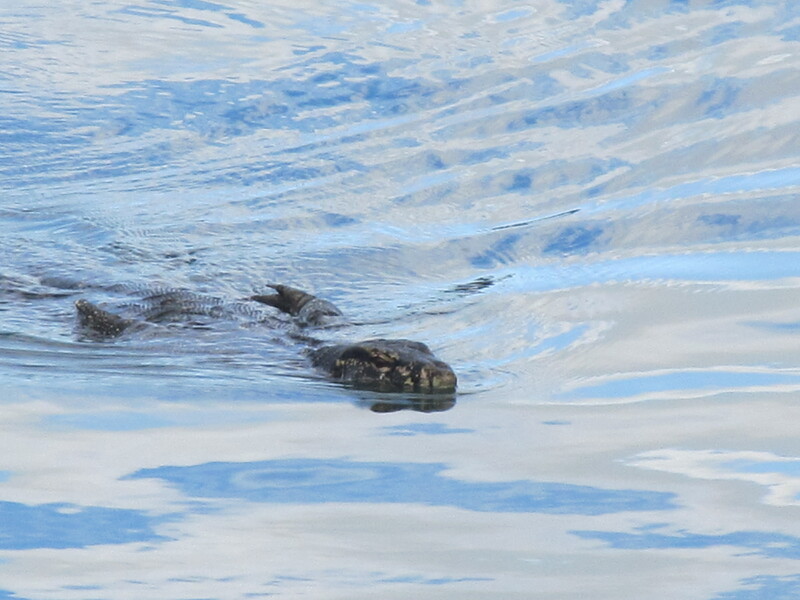 He just suddenly appeared on the boat didn’t say anything and took amazing pictures. Now here he is merrily balancing the boat as we speed across the ocean. 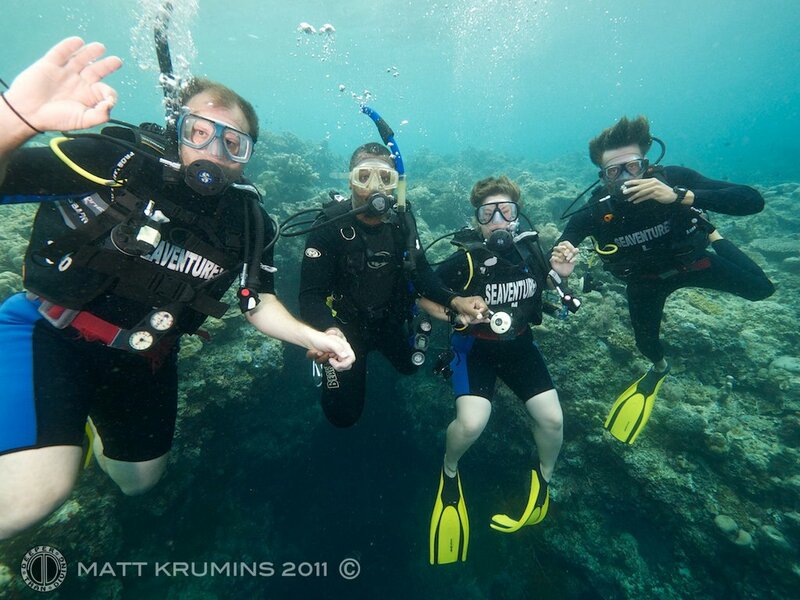 The Fearsome Foursome were missing one member but the remaining three were psyched for the upcoming dives. When we finally arrived at the tiny island we had to sign in. This is to prevent too many divers from using the site. 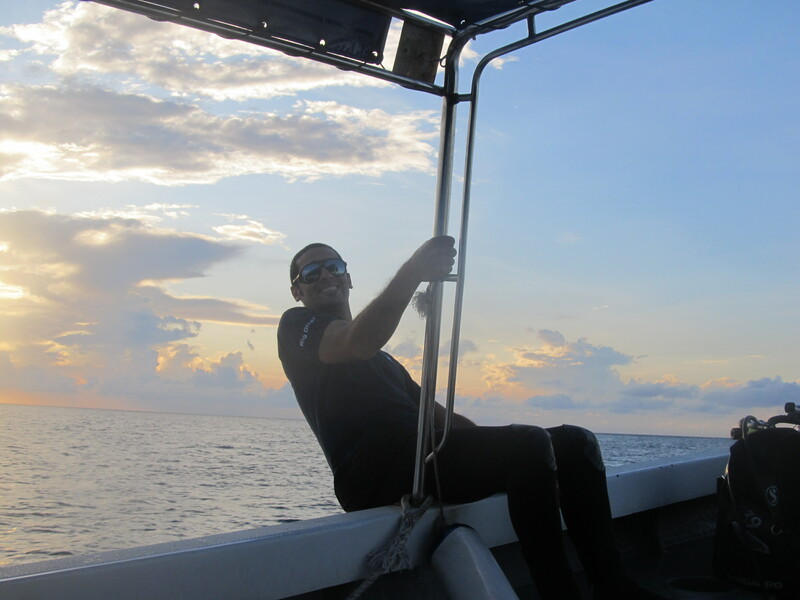 Each dive company gets a specific number of “visas” for their divers and Seaventures gets 13. 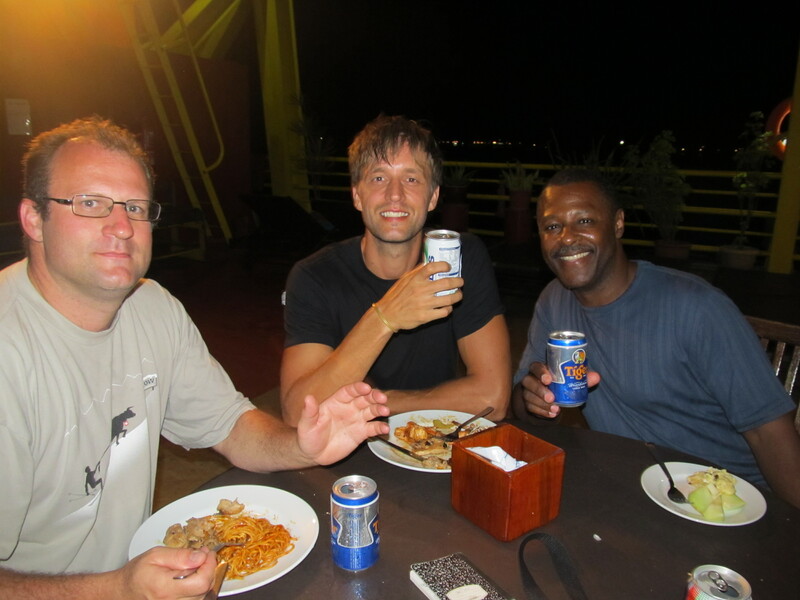 However 3 were being used by a Russian millionaire who didn’t even invite us for a drink, hence Martin missed out on the first Sipidan dive, but went to some surrounding islands instead. After checking in and signing away our lives, again, we got back in the boat and headed out for our first dive site “white Tip Avenue” to see the Bumphead Parrotfish Parade. This is a daily phenomenon around 6.45am. 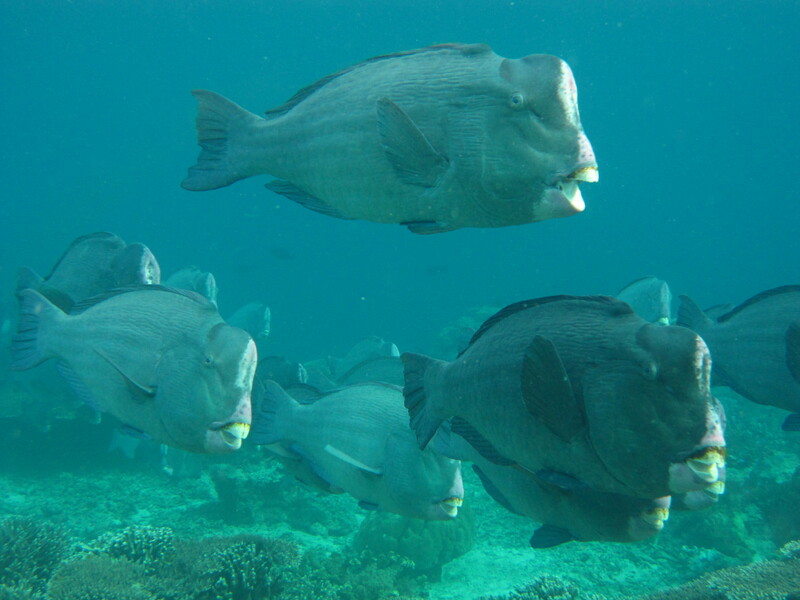 Numerous Bumphead Parrotfish make their way to feeding grounds in a long line, similar to a parade. You might think there would be about 10, but no on this first day there were hundreds, I am sure, as the parade kept on and on and they are fairly large fish. See the parade for yourself. The most exciting discovery as we oohh’d and ahhh’d at the parade was that Dave’s 2nd mask works!!! I can see, and not only that it has nifty little magnifying lenses on the bottom so I can see the dive computer way easier. Woohooo now lets enjoy the diving!!! just a smidge of water in the bottom, but I can SEE!!!!! And then something wrapped around my ankle and arm and stung like a …insert expletive here… Yup my first jelly sting, luckily it was not a serious one and when we surfaced we discovered that most of us had had a close encounter with 1 or 5. After a breakfast and much needed pee stop, for some reason being at depth seriously contstricts your bladder, we had time to look around the island. However we were strongly warned not to walk around the island and only stick to the beach in front of the picnic area, otherwise the soldiers might shoot us. I thought they were joking until I saw the soldiers. 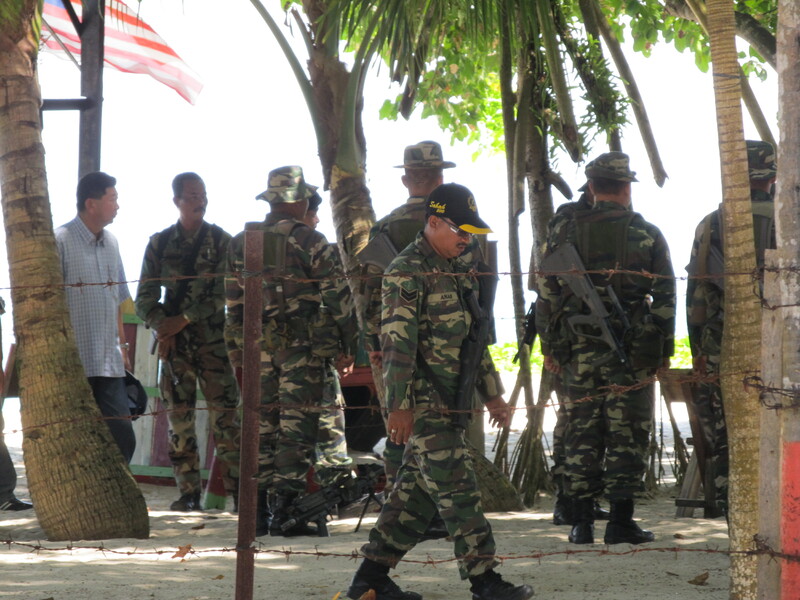 This is due to Sipidan being on the border of the Philippines and Malaysia and home to many unsavory groups. A kidnapping occurred there in 2000, when 20 hostages were taken by possible pirates or separatists. Sipidan used to be home to a luxury resort, but since the kidnappings and due to the ecological value of the island the resort has since been dismantled, diver numbers restricted and a permanent army unit placed on site. Tourists are not allowed to walk around the island to protect the natural biodiversity and bird habitat. The next two dives were as spectacular as the first. 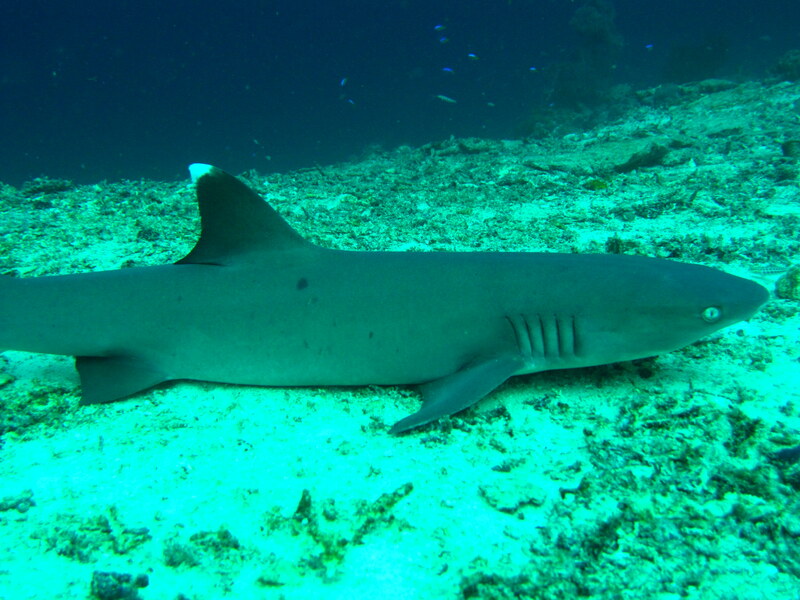 Hanging Gardens was a deeper wall dive hoping to catch a glimpse of the elusive hammerheaad sharks. No luck there but still stunning. 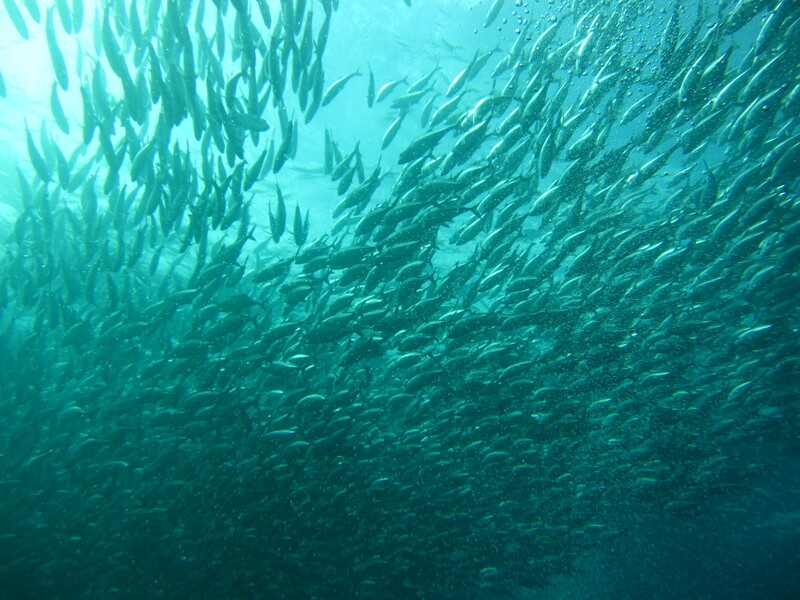 Barracuda point lived up to its name with massive schools of Barracuda that were downright intimidating. I tried desperately to memorize the fish species but the minute I opened the ID book there were so many varieties I could barely keep track. I fear cold water diving may be lost to me forever!! After 3 stupendous dives we headed back to the rig. 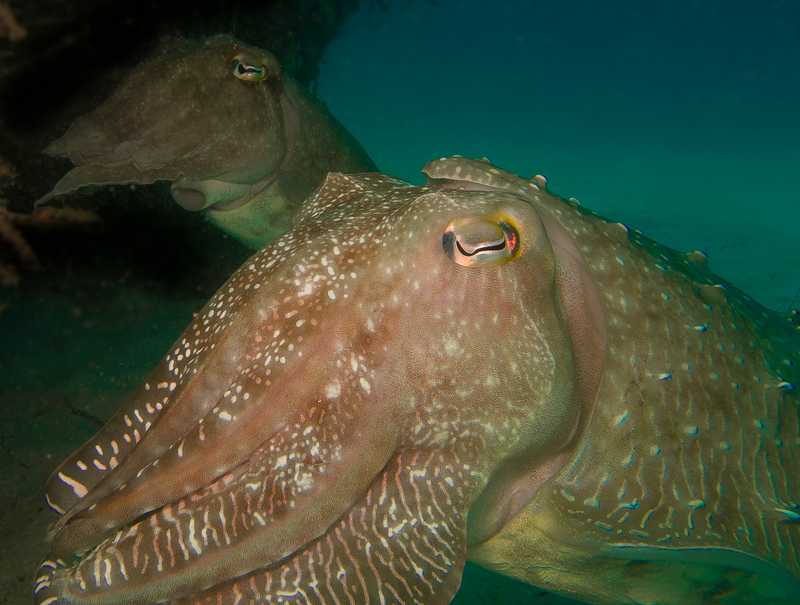 We all agreed to play down just how fabulous the dive was so Martin wouldn’t feel bad, but when we heard they got to see the flamboyant cuttlefish all pretense went out the window and we all gushed at the spectacular things we had seen. Back by noon we all sat down for another yummy meal and then the others headed out for their third dive. I spent the afternoon soaking up some rays and napping. 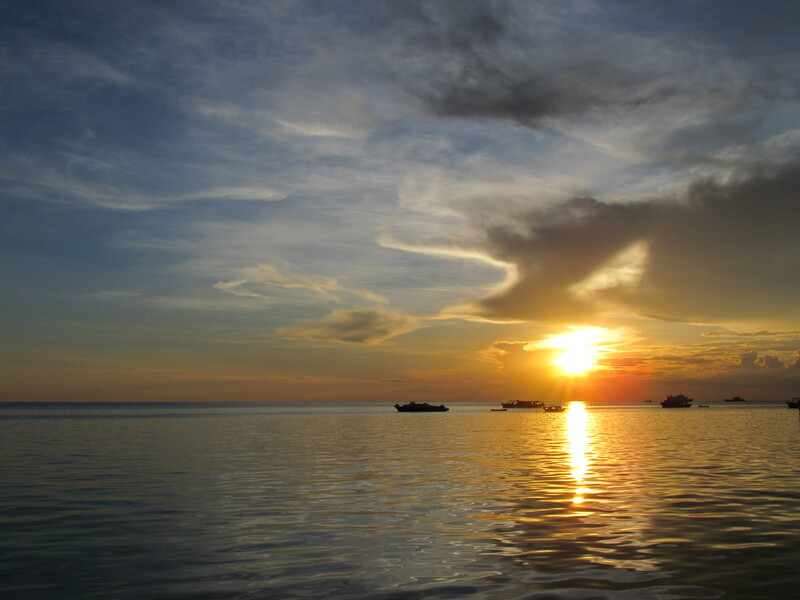 Just a short 3 minute boat trip from the rig is Mabul island, and every night they offer a free ride where you can enjoy the island for an hour and return in time for dinner. Technically this was to be Urs, Martin and my last night on the rig and so, along with Dave, we went to explore the island. At the same time Martin and I were deciding to stay an extra night as it was just too amazing to leave so soon. Mabul, like Semporna, is a an oxymoron, a contradiction. You have an exclusive resort right next to a village of sea gypsies that live in abstract poverty in most cases. There is no education in regards to litter and it is everywhere. 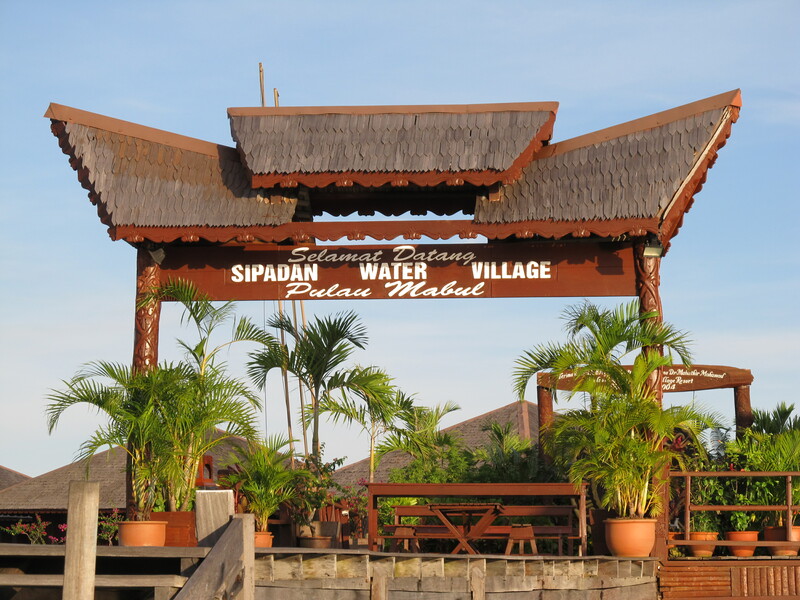 There is also talk of dismantling the resort and possibly the rig from Mabul island in the same way as Sipidan and turning it into a natural heritage site. 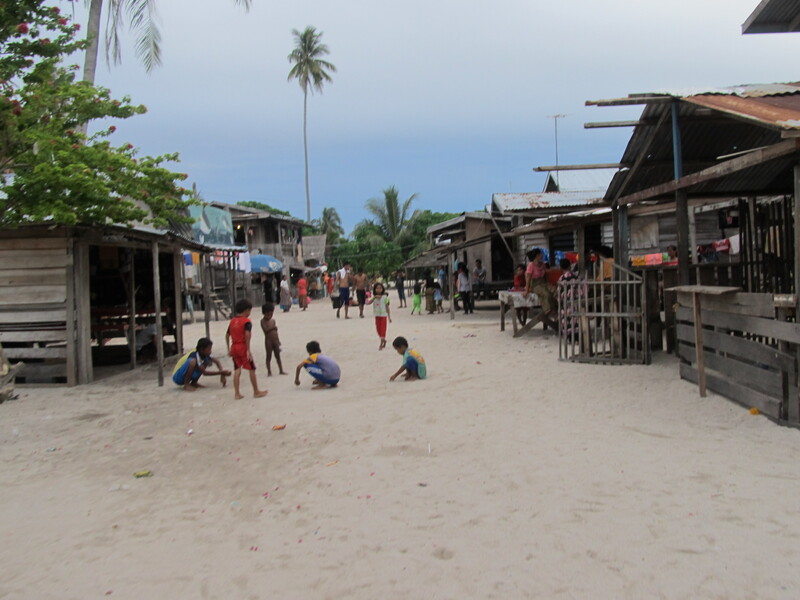 However, there is the large community of displaced sea gypsies to re-home if such a plan was acted upon. The four of us wandered through the island with our fearless leader, Martin, armed with some vital Malay vocabulary, in the lead. We came across some beautiful (the people) and some sad (sick kitten) sites. Here are some pics to get an idea of the place. A fantastic day full of adventure and beauty and friendships. 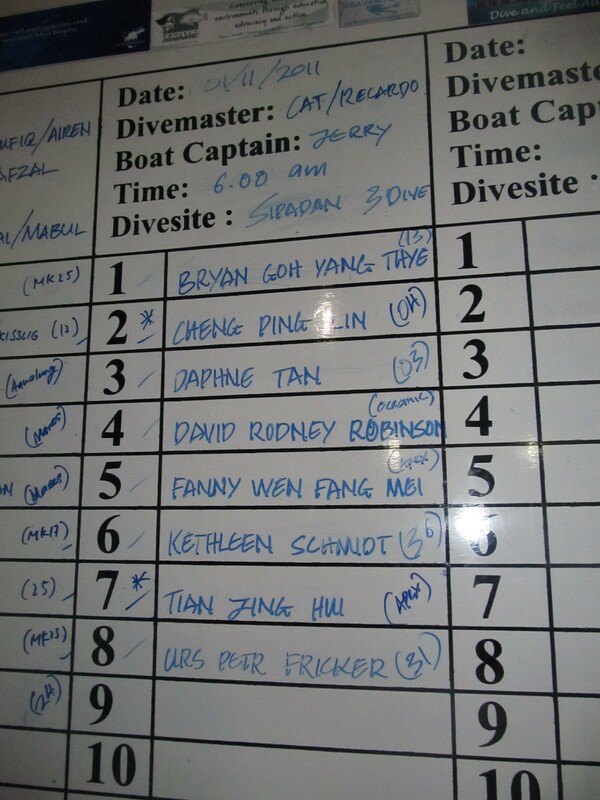 tomorrow is another early morning as we all made the Sipidan dive! If someone told me at the beginning of this trip I would utter the sentence “Heading to Borneo to go Scuba Diving”, I would have thought them mad. Borneo is one of those near mythical places like Timbuktu and Zanzibar, you always want to go but never think you will get the chance. It still seems a little ostentatious when I say it to myself. Add to that “will be living on a converted oil rig” and its downright pompous. 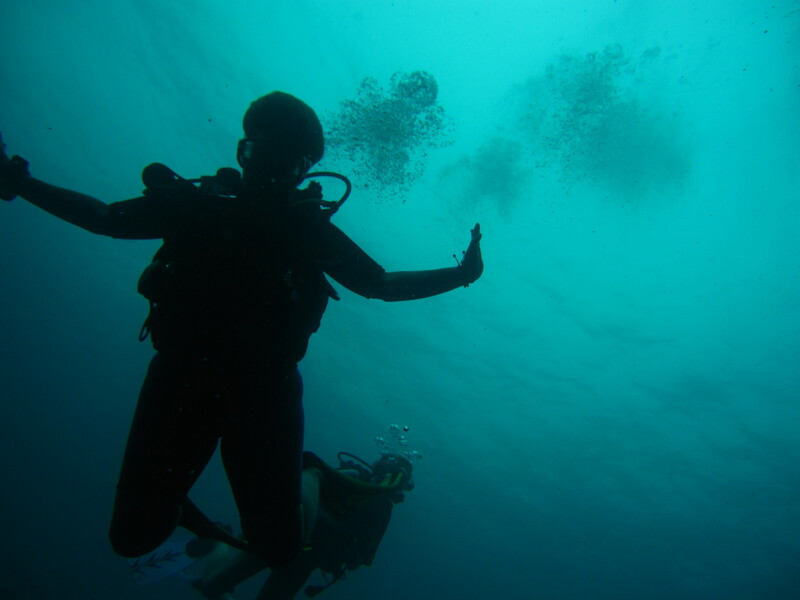 I have been diving while traveling but I have never organised a trip or part there of directly committed to the act of diving, I am so glad I did! After my fabulous friends dropped me off at the airport, I headed through security and hung out in the waiting area. Didn’t have long to wait before boarding. The fun part was that 2 flights were boarding from the same gate, one to the left and one to the right, so you had to be extra careful you went on the right flight. 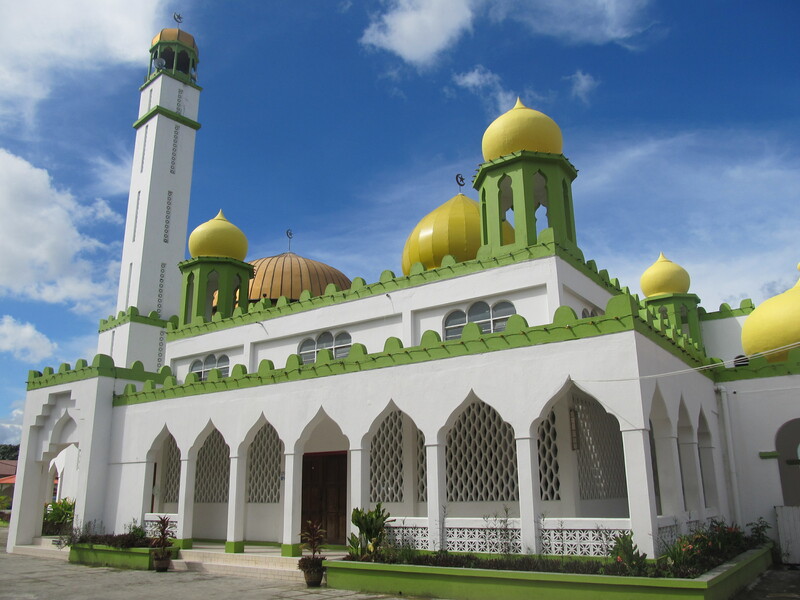 Borneo is an island off the south of Malaysia and it is separated into Malaysian Borneo and Filipino Borneo. I was leaving mainland Malaysia and Flying into Tawau part of Malaysian Borneo. On the flight I had thought how unnecessary it was to bring my passport and risk losing it. But it turns out you have to go through immigration! What do you know! I had planned to take the cheap route of local bus into town then bus to Semporna from where I would take a boat to the rig the following day. Exiting the airport into tropical island heat soon made that thought waver significantly. I asked a guard how to get into town and he directed me to a tourist shuttle, which while still 6times the price of the local bus was still cheaper than the taxi. Oh what the hell, its too hot to argue. The drive took around 1.5hrs and except for the fishtailing and hydroplaning during a sudden rain storm the drive was quite pleasant. Arriving in Semporna the driver dropped me off at my backpackers and after relaxing for a bit I went out to explore. 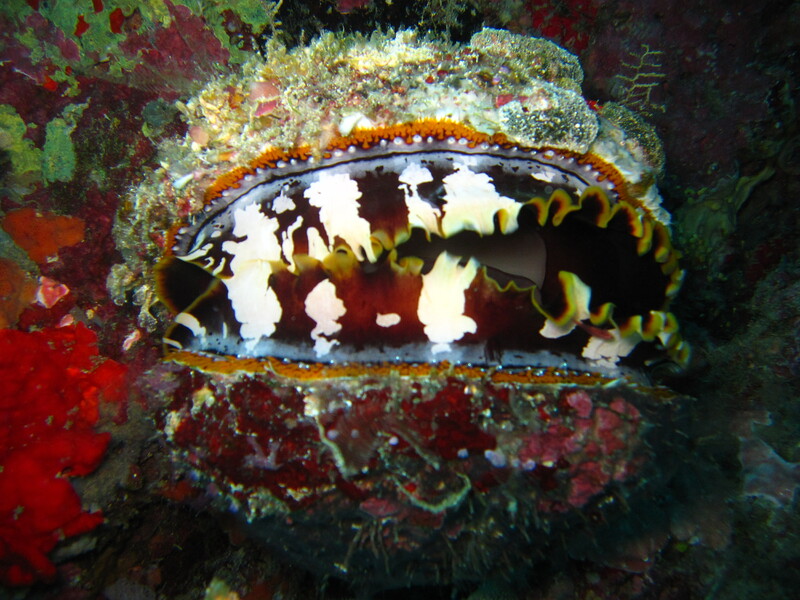 For being the entry way to some of the best diving in the world, Semporna is remarkably undeveloped and touristy. It reminded me a bit of Puno in Peru, gateway to Lake Titicaca, rather dirty and not very tourist friendly. 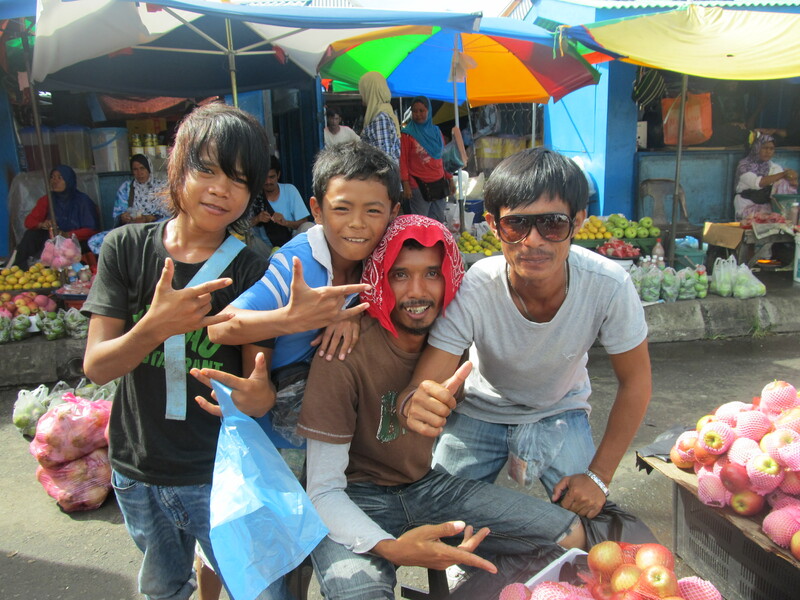 However, the people were really friendly and their smiles blew you away. One little girl started following me trying to convince me her name was “Money”… When she realised my purse strings were shut tight she told me her real name, which I could barely pronounce. But the people are wonderfully friendly and truly beautiful. 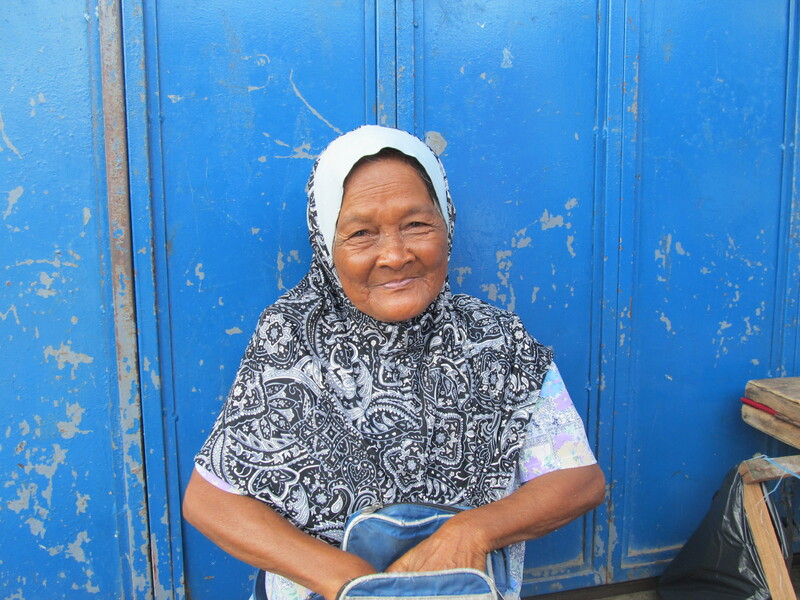 This old lady was selling sweets and juice on a street corner. She had such a beautiful face and acted all shy when, after buying a few sweets, I asked if I could take a photo indicating I thought she was beautiful. You wish you could sit down and hear all about their life. I went back to the hostel and on the way saw something in the water. At first I thought it was a large snake, then a crocodile, then I was certain it was a crocodile. After taking a photo and zooming in I realised it was a huge, freaking monitor lizard. That would surely give you a heart attack if it came swimming towards you. It must have been almost 2m long. After a nice afternoon nap while listening to the rain, I headed back to town for lunch at a place called Scuba Junkies. I wavered between the pizza and the steak but on my waiters encouragement I went with the steak. I truly hate sitting alone at a restaurant, unless I have a book or a computer, something to do. A lone guy sat across from me at the next table and after about 10min of trying to build my courage to talk to a stranger I blurted out “have you been diving Sipidan?”. His eyes lit up and he said yeah and it was amazing. I asked if I could join and soon we were deep in discussion about diving and what it was like. My steak arrived and it was heaven on a plate. Perfectly medium and with the nice little crunch on the skin….mmmmmmmm steak!!!!! He was from Scotland but lived in Bangladesh where his family ran a clothing factory. How random is that?? I told him I had a 10hr layover in Dhaka and asked advice. What is the likelihood of meeting a Scotsman, living in Bangladesh, having dinner in Semporna. Unfortunately he wasn’t due back for another week otherwise he would have come to pick me up at the airport. What a bummer! But still, you kind of want to break out in song…It’s a small world afterall…..
New Friends and the… RIG! I was awake early and had a 2hr wait till my pickup for the boat ride to the rig. I hung out at the hostel and had my free toast and coffee breakfast and finally the time came. I was sooooo excited. We drove to the office so I could sign my life away and pay the balance. As I walked in I saw a rather dashing young man, and we immediately started talking. Martin is a lawyer, 40 (although hard to believe) from the UK living in Australia, who has quit his job to travel for over a year and plans to study social work. He was super pumped about the rig as he had just walked in and asked about it and found himself set for 3 days 2 nights, same as me. We also met Dave and Urs who would be there the same time. Dave would be staying 5 days. It was then that the Fearsome Foursome was formed. We all got on ridiculously well. Martin from UK/AUS, Dave from USA, Urs from Austria (I think) now in Australia and me from SA/USA. What a mottled crew and perfect at the same time. We loaded into the boat and headed out to sea. An hour long boat ride past villages and island and a community of sea gypsies. Sea Gypsies are people from the Philippines who left at some point to go fishing and the like. When they tried to return they had no documents and were refused entry. 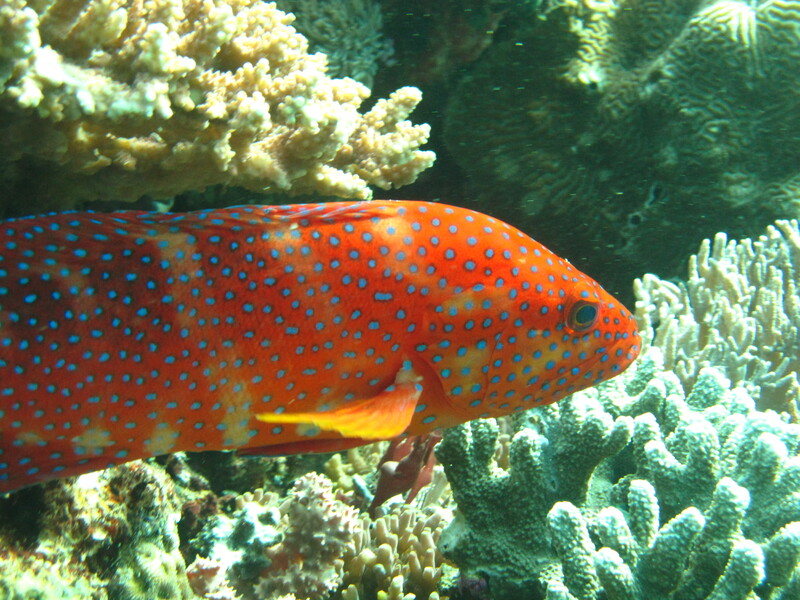 Now they live on the ocean or islands along the border of Malaysia and the Philippines. Finally, the RIG appeared on the horizon, and what a sight it was. None of us could believe we would be staying on that beast. Technically it hadn’t been used for oil but rather as a repair station for ships at sea. 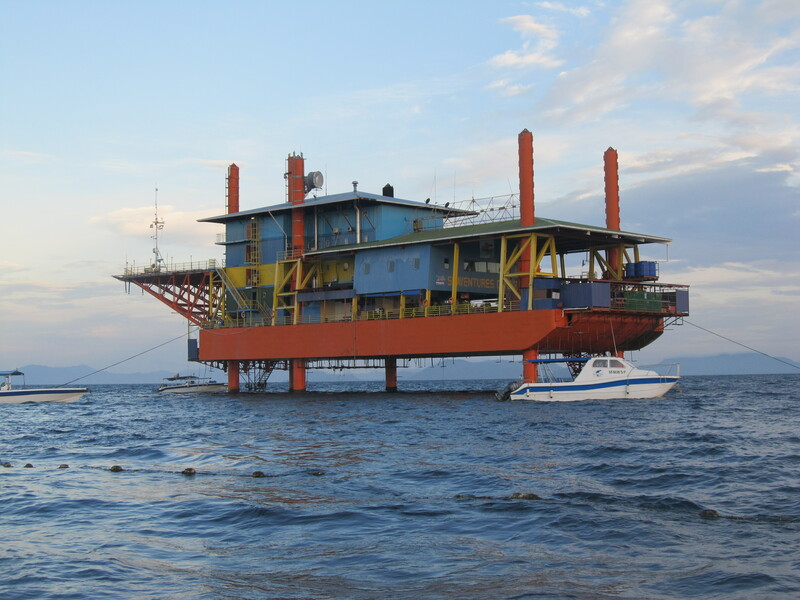 When a partnership, to build a luxury resort on Mabul Island, between 2 millionaires broke up the one built the resort the other brought the rig to Mabul bay and placed it right in front of the resorts view. 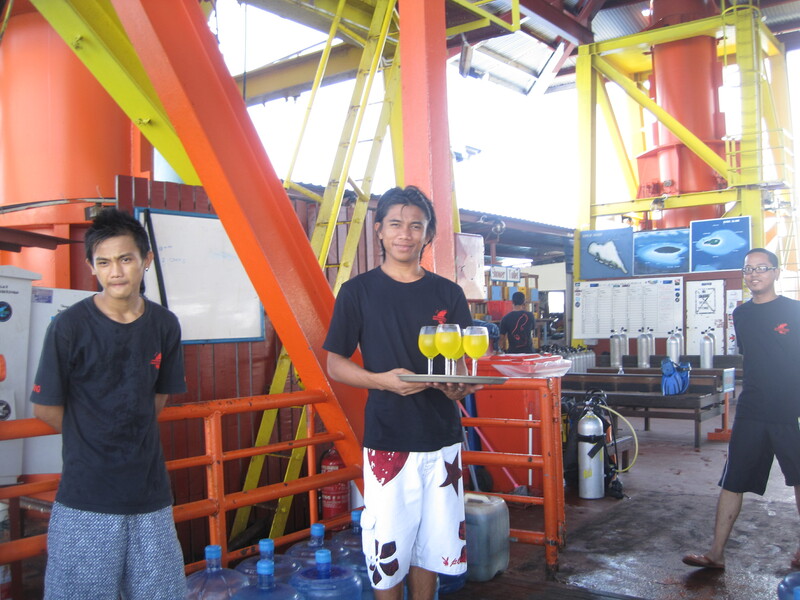 We took the “sea-lavator” from the boat up to the rig platform and were greeted by the staff with juice. 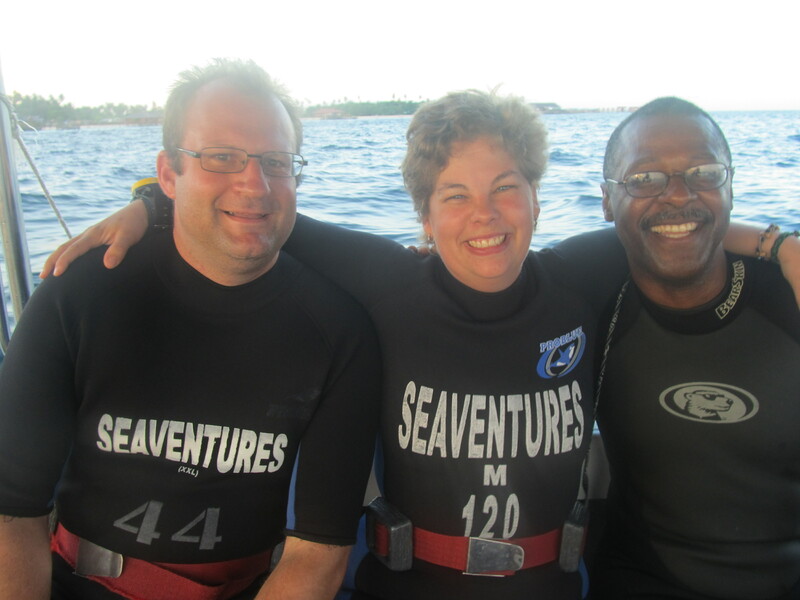 Then we had our introduction, signed away our lives again and were introduced to the dive master, Jon. He gave us a run down of our check dive and then it was off to our rooms to get changed and ready for dive one. As it was low season we were lucky enough to have our own rooms. One of my biggest fears, especially after a couple of years without diving, is putting my gear together wrong. I had hoped they would simply set it up and place it on your back. But no, Jon pointed at my gear and said we leave in 10min. Racking my brain I remembered which way to attach the regulator and such and finally had everything set, including trying to work out how much weight I needed. This was tricky as I usually dive in cold water with a thick wet suit using pounds and now I was in warm tropical water, my first time, in a short thin suit using kilograms. But after some math, never a favorite task, we figured out about what I needed. Eventually we were all loaded and on the sea-lavator heading straight down into the ocean and the house reef below the rig. I have to say its downright awesome to just say “going down” and next minute you are knee deep in the warm tropical ocean. 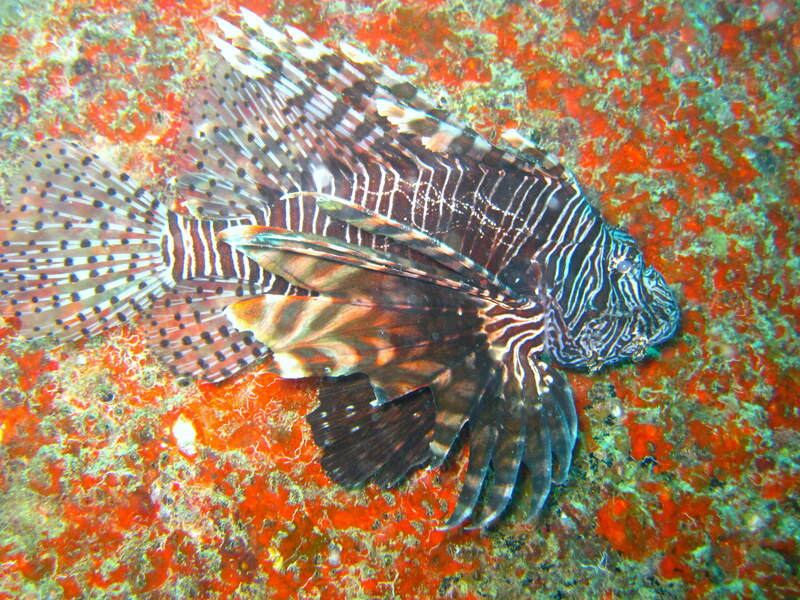 The dive was spectacular with tons of amazing fish and nudibranchs and such. Unfortunately it was the start of some serious mask issues. Due to the smallness of my face and the only style of mask I had serious leakage problems and spent most of the dive trying to clear my mask. 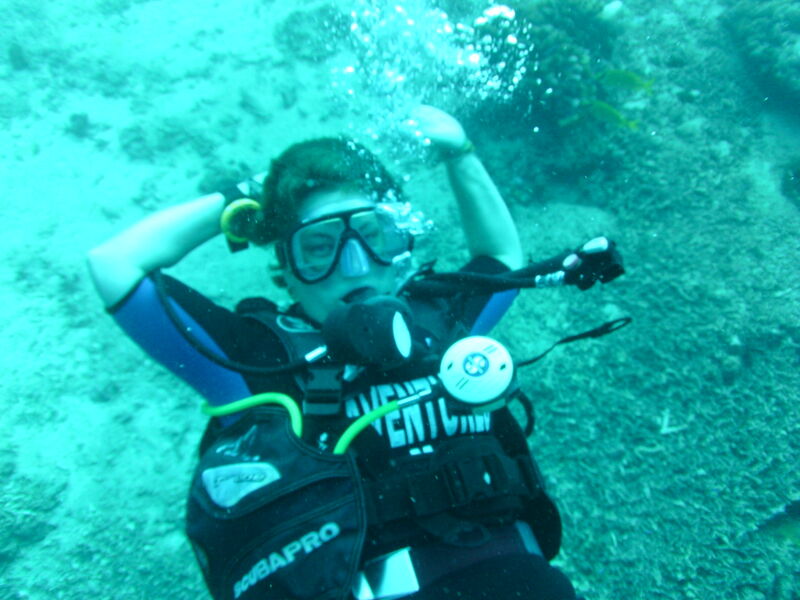 But on the upside the water was 28C, that’s 10 degrees warmer than my warmest dive so I was in heaven. After an amazing dive, we headed up on the sea-lavator and had some lunch. Then after some mask discussions we tried a different one to see if we had luck there and headed down again to the boat for a dive near Mabul Island, just a 2min ride away. I had also requested a smaller tank and bcd as I kept nearly floating out of the bcd and the tank kept clonking me in the head. The dive was great but again I was miserable for the most part as this mask was even worse. 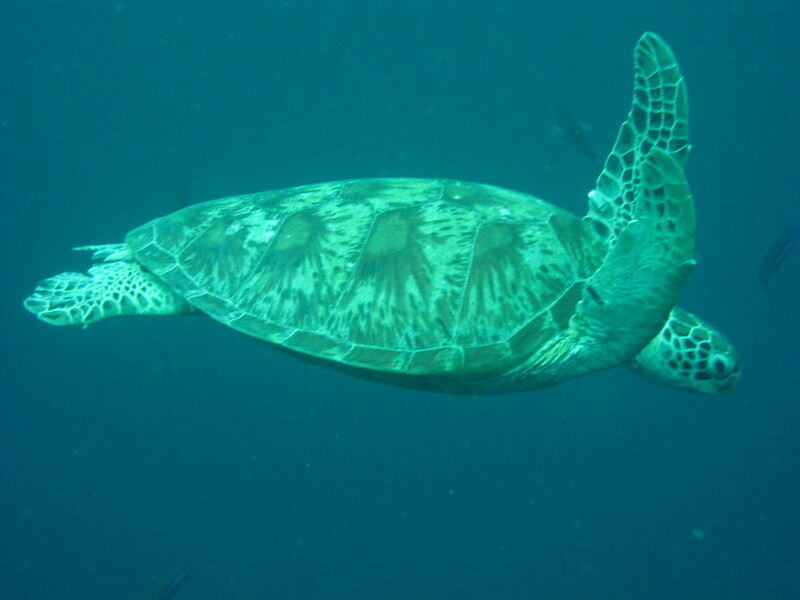 But we saw amazing things, 2 broadclub cuttlefish and so many turtles that were gargantuan in size. I sucked my air as the mask made life difficult and so had to surface early with Urs and Dave. We hung out at the surface until the boat picked us up. Or rather picked them up, the instructor told us to swim and then when I got there told the others to wait and picked them up. 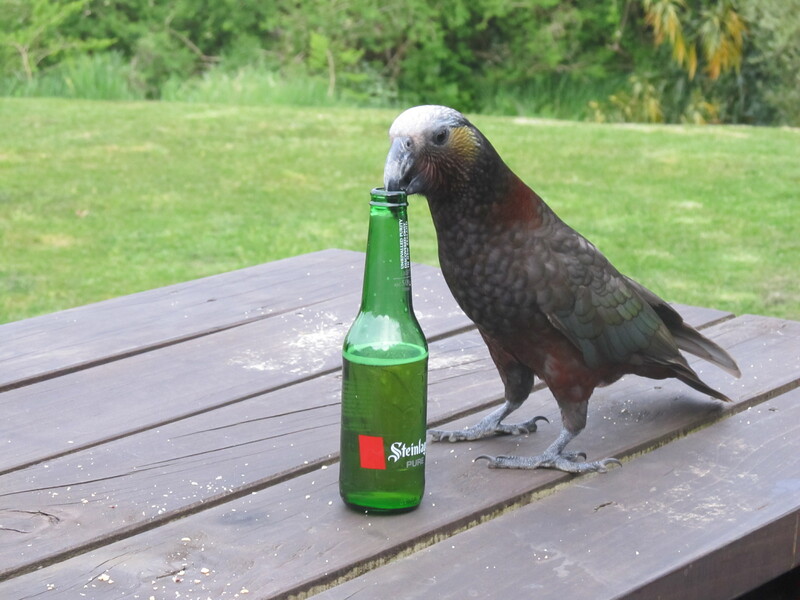 Dave chose beer-o-clock when we got back but Urs, Martin and I went for one more late dive. 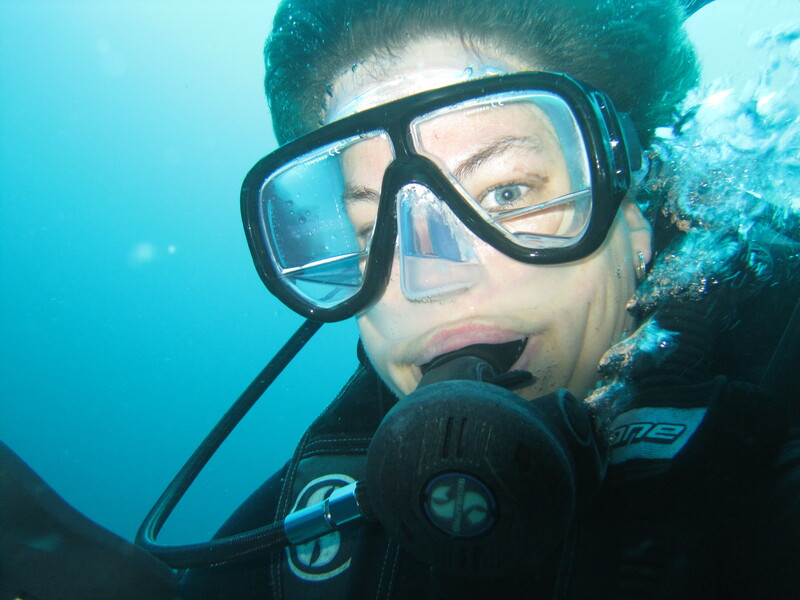 And this time one of the dive instructors offered me his mask to see if it worked better. It didn’t work perfectly but it was a little better. We had decided to leave too late so it got pretty dark down there at one point. 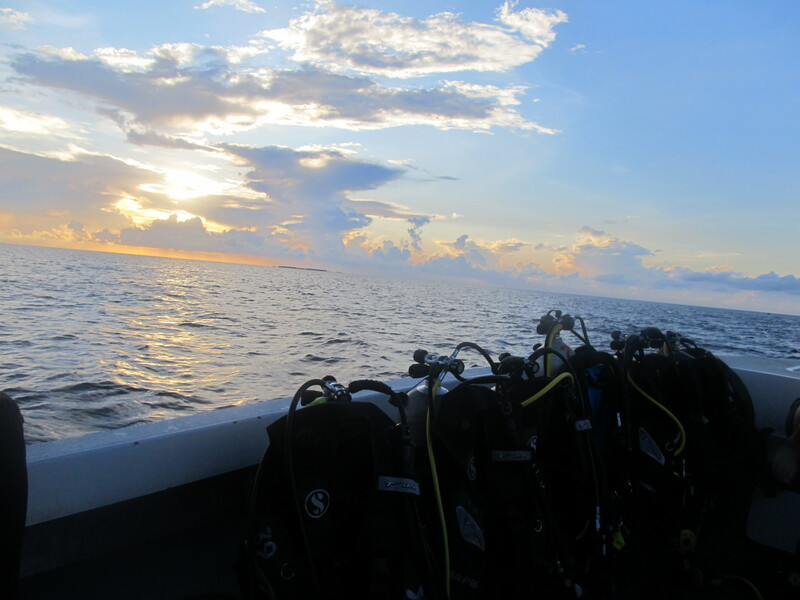 But still a great day of diving. 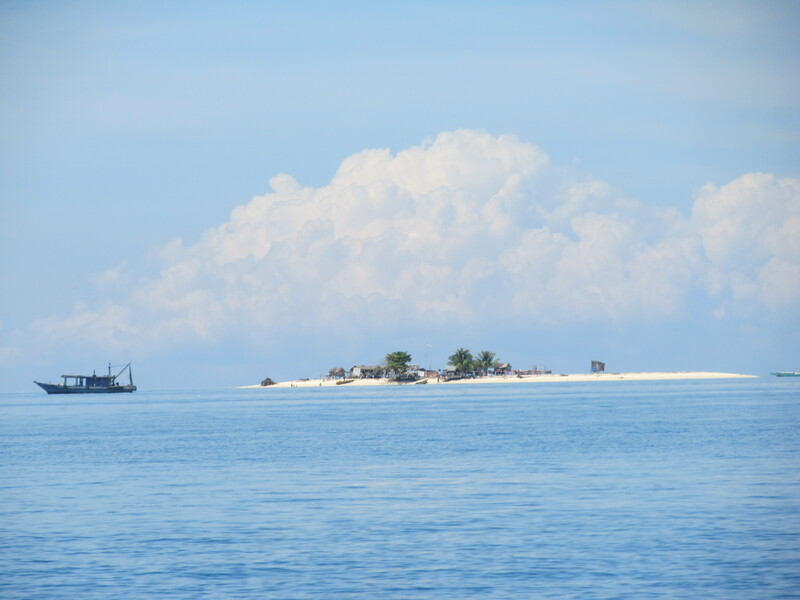 That evening we eagerly awaited the list for who was going to Sipidan Island, the place to be when you are in the area. Finally the list was revealed and everyone, except for Martin, had got a pass. 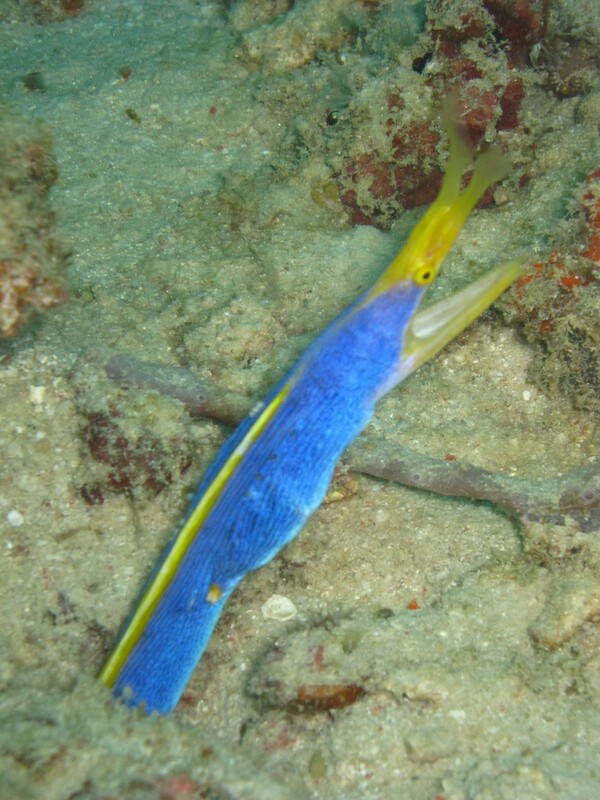 He was rather unhappy about this but he was on the list for diving at some of the other islands. So tomorrow morning at 5.30am the alarm will go off. Dave has an extra mask and so I will give that one a try and pray that I have better luck. Day 1 has been incredible, the food fantastic and the staff awesome. Can’t wait for day 2.